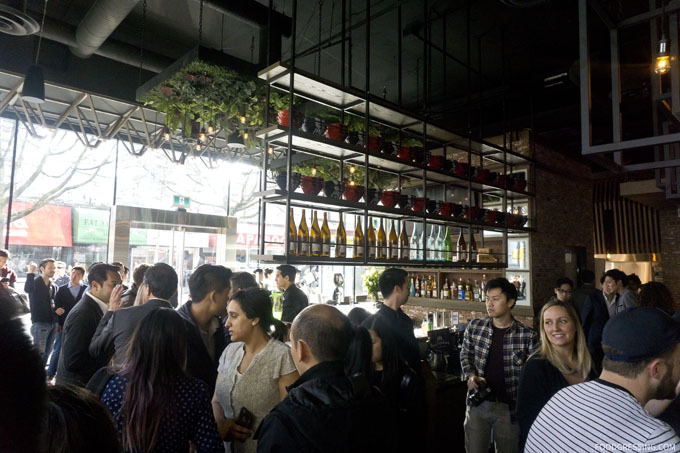 I grew up in the Ironwood area of Richmond and over the years have seen quite an improvement in the variety of dining establishments being set up there. I remember back in high school our go-to restaurants at Ironwood Plaza were fast food food chains and casual restaurants including Boston Pizza, McDonalds, Tim Hortons, Kelsey’s and Death by Chocolate. Since then, with a growing Asian population, Ironwood has seen more Asian eateries open up. 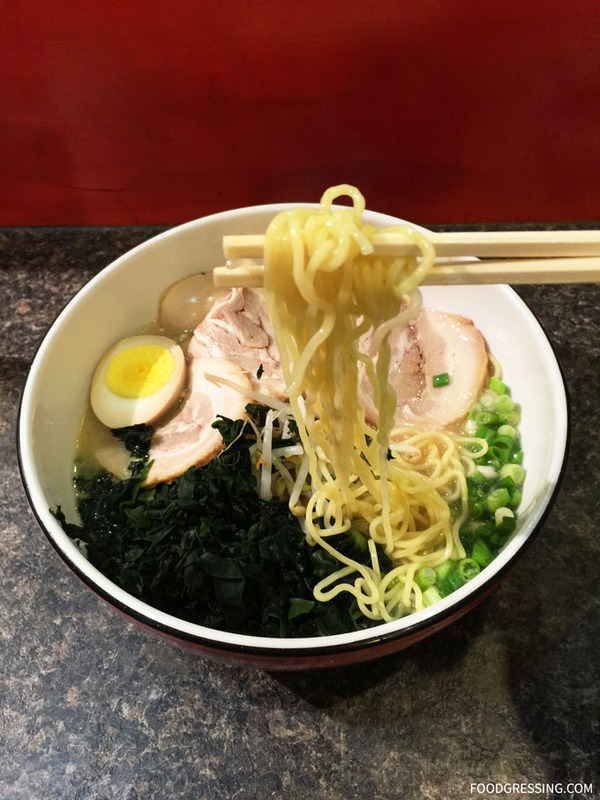 One newer establishment that appeared last year is Ichigo Ichie Ramen. I decided to give this place a try recently after visiting my parents who still live in the area. Note: This post is not sponsored. None of the food is complimentary. Opinions are my own. 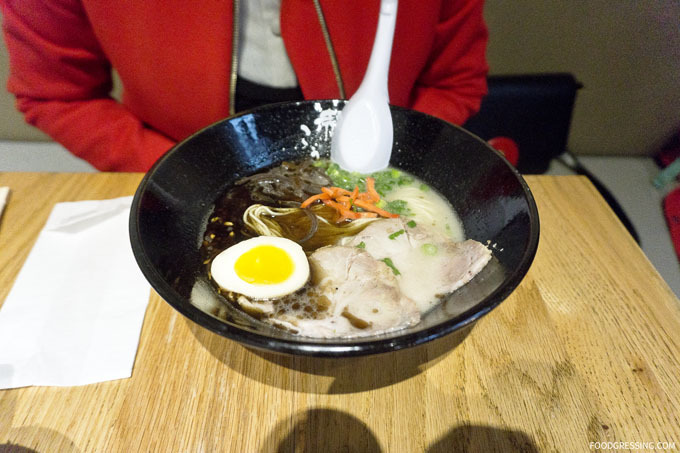 Ichigo Ichie Ramen boasts a modern interior with mostly dining tables for two. 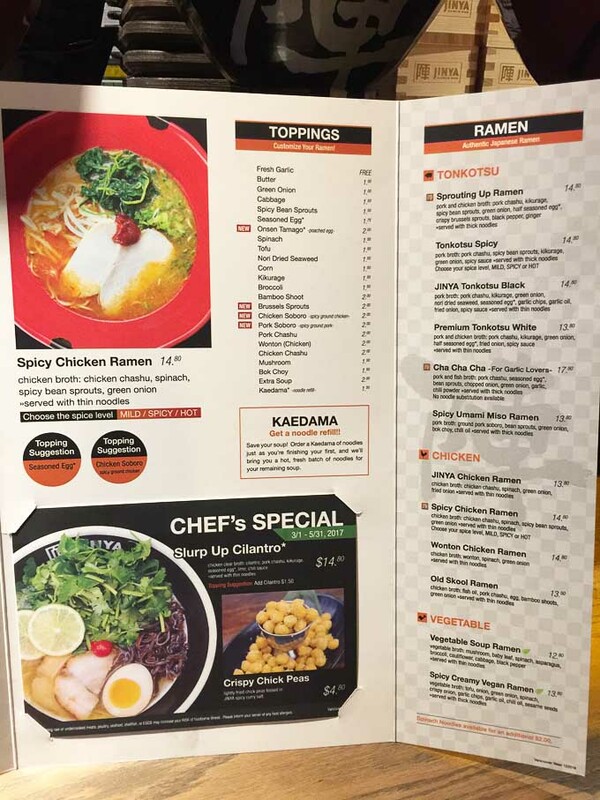 The ramen bowls are priced between $10.95 – $11.95. 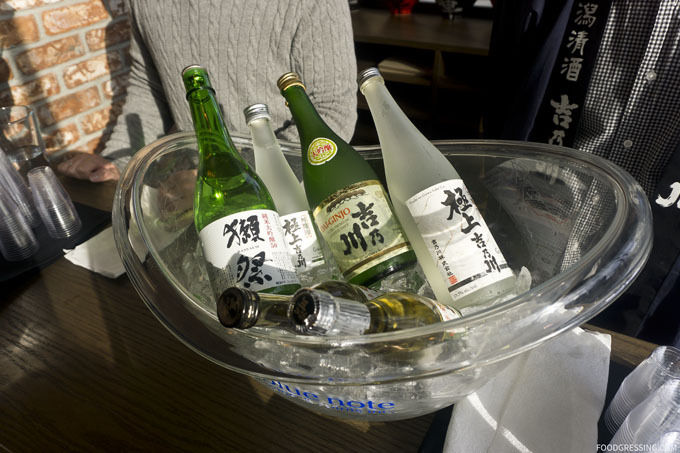 They offer the standard flavourings (shoyu, shio, miso, spicy) and three broth choices (pork, chicken and vegetable). For chashu, they offer chicken and pork. 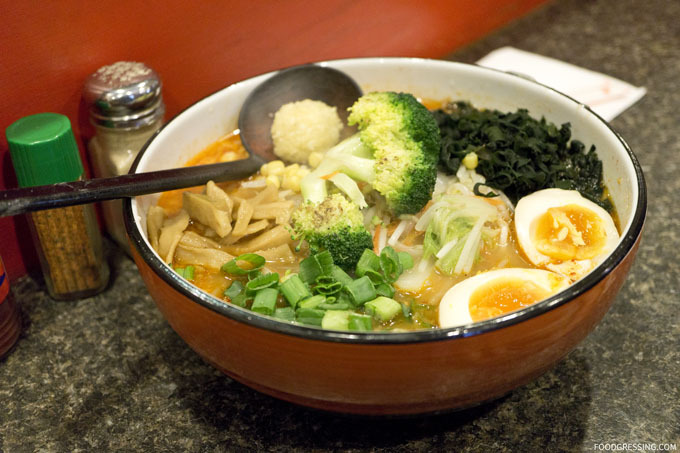 Aside from the vegetable ramen bowl, all the other bowls come with a ramen egg. I also noticed that the bowls come with shiitake mushroom which I don’t usually find at other ramen restaurants in Vancouver. 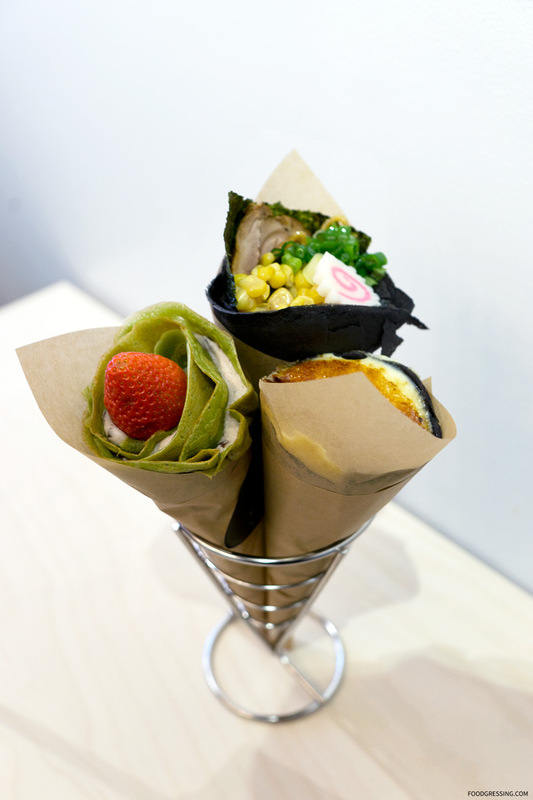 Additional toppings (like chashu, nori, bean sprouts and so forth) are available. 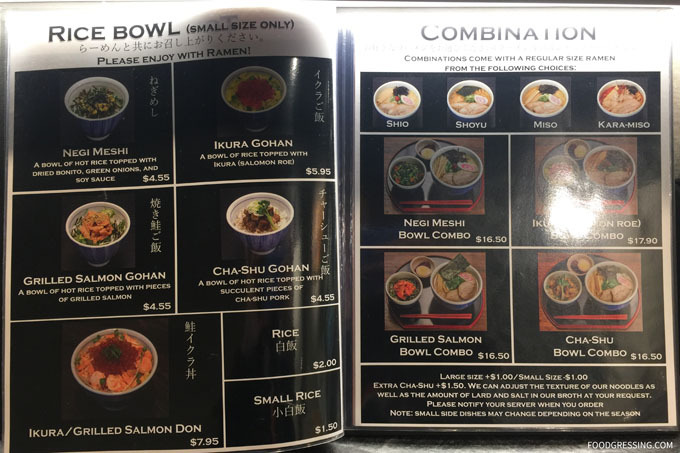 They also offer small rice bowls on the side for around $5. For side dishes, they have gyoza and karaage. 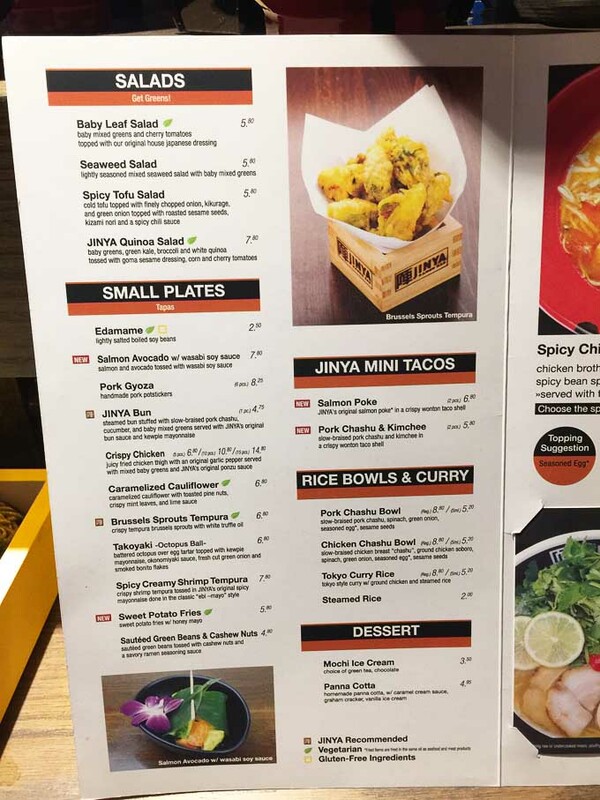 For a larger photo of the menu, click here. Each diner must fill out a form marking choices for his or her ramen bowl. There weren’t any options for noodle thickness, broth richness, saltiness etc. I had the Miso ramen with tonkotsu broth and pork chashu. It also had green onion, seasoned egg, bean sprouts, seaweed and shiitake. I ordered sweet corn for an additional $1. For a tonkotsu broth, I definitely didn’t find the broth to be rich and creamy enough. It was a light broth, which if you didn’t want to feel heavy in the stomach afterwards, would be fine. I usually get the additional corn topping on the side and add it to the bowl myself. However, at Ichigo Ichie, it came already in the bowl. I found the portion given to be a bit less than other places I have gone to. Other than the broth being light, everything else seemed OK. The chashu was reasonably tender; the ramen egg had a nice, firm but runny yolk; and the noodles were fairly al dente. My husband had the Mayu (spicy) bowl with tonkotsu broth and pork chashu. It had garlic black oil, green onion, seasoned egg, bean sprouts, deep-fried garlic, and shiitake. I sampled the broth and found it to have a decent spicy kick to it. It had been a few years since I last visited Hida Takayama Ramen (see previous review here) so I was excited to revisit them again when they contacted me for a media tasting recently. Disclosure: I was invited to a media tasting. All opinions are my own. 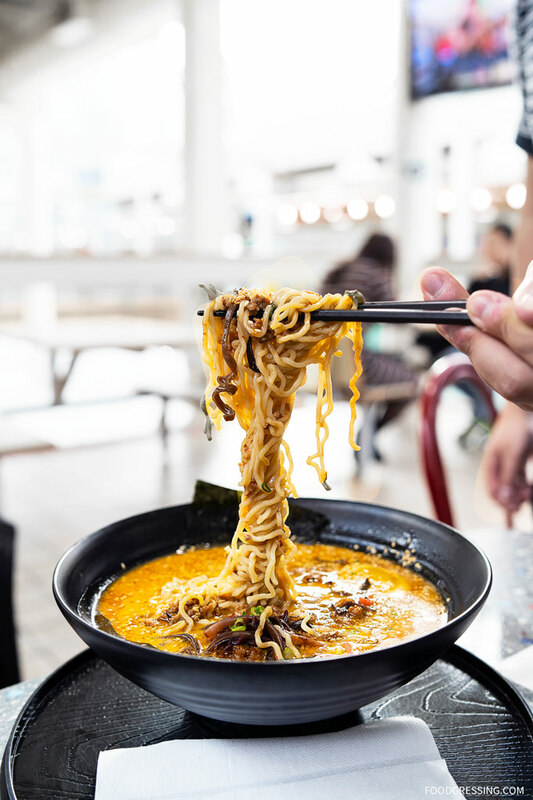 This humble ramen eatery is a hidden gem of sorts; it does not exist as a standalone restaurant but rather a food stall located on the second floor of the Robson Public Market. Hida Takayama Ramen has been around for 7 years offering Takayama-style ramen which is unique to Vancouver. 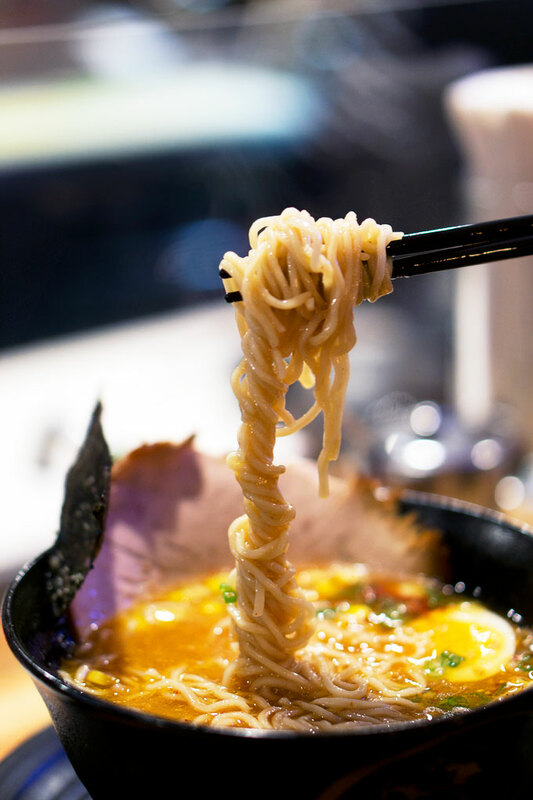 This style of ramen is characterized as being more “Chinese-like” with it being less rich and heavy but still deep in flavour and imparting lots of umami. The noodles that are used are thin. Most recently, Hida underwent new ownership as the original owner retired and sold the business to the guys running Yui Japanese Bistro. Reg and Ping, who own and operate Yui and both were ex-sushi chefs for Minami and Miku, recently brought in a new partner, Sunny, to run Hida. They had been regular customers of Hida and were eager to take on this new venture when they heard that the owner was retiring. Being trained chefs, the guys were able to improve upon the recipes and provide more consistency. 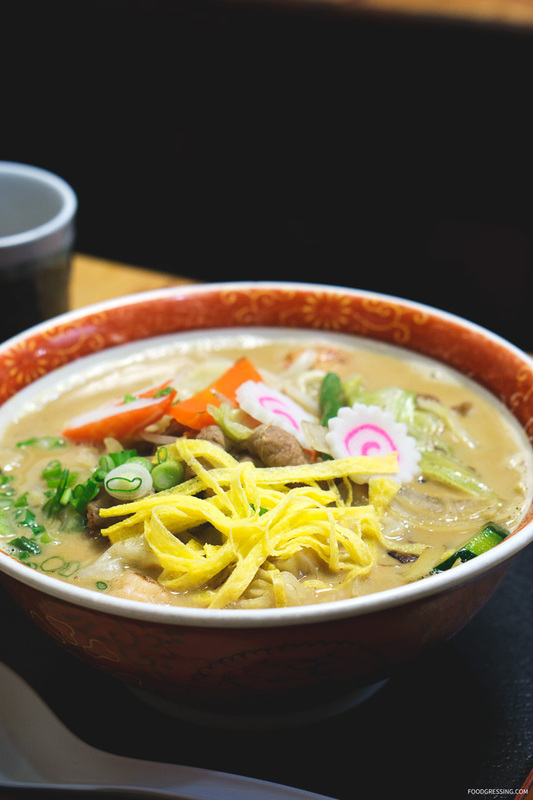 What is also unique about Hida – aside from their ramen style compared to other Vancouver ramen houses – is that they make their own noodles, gyoza and their food has no MSG. 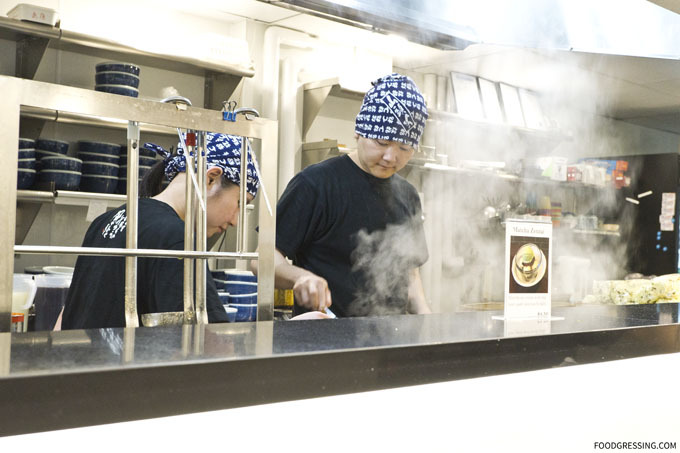 The original owner still makes noodles himself as well as the gyoza and supplies them to Hida. 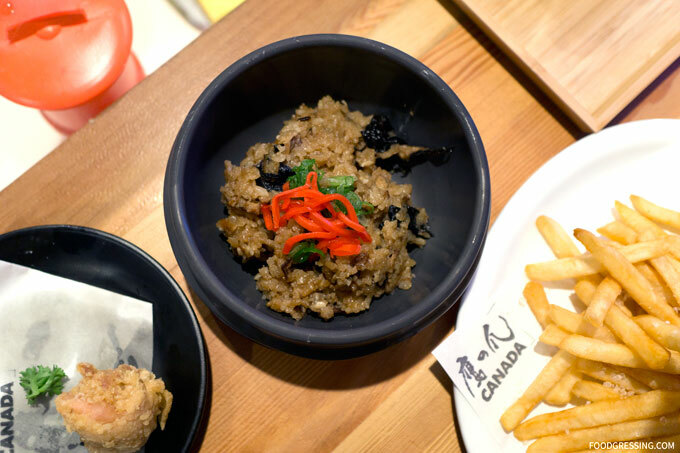 The menu at Hida is simple yet focused and you won’t find customizable choices like chashu fattiness, noodle thickness, soup richness and so forth. 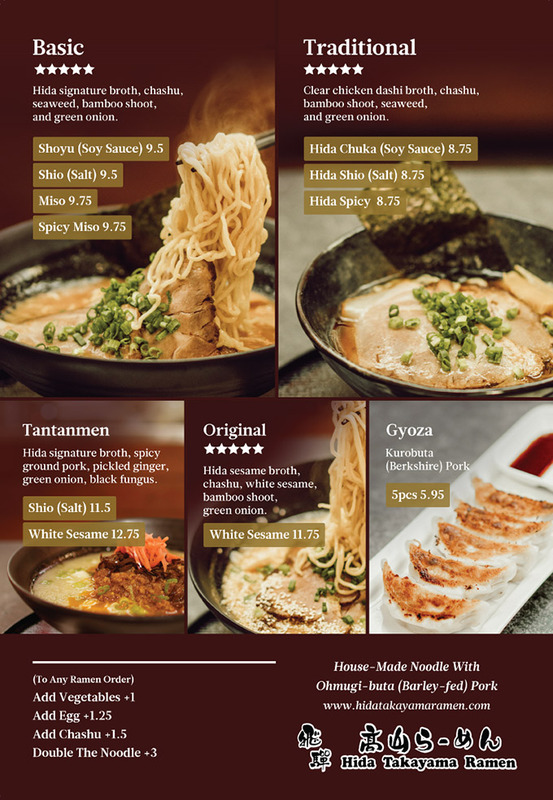 They offer 4 choices of ramen (Basic, Traditional, Tantanmen, Original) in different flavours like shoyu, shio, miso and white sesame. The Basic, Tantanmen and Original use a pork broth base while the Traditional has a chicken dashi broth. The bowls are priced affordably starting at $8.75 and the most expensive option being $12.75. 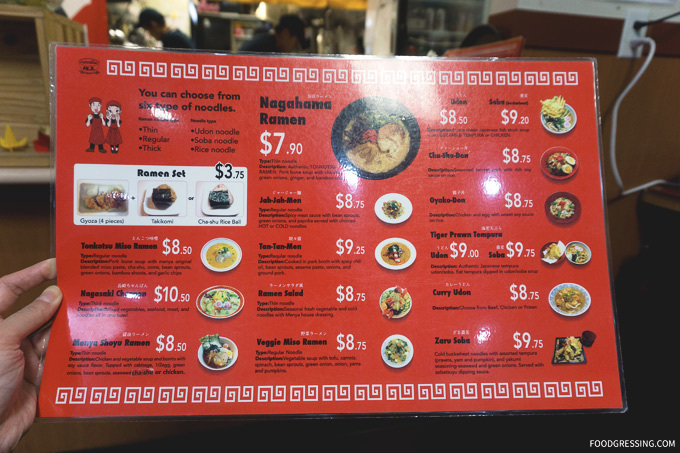 Their price is quite fair compared to other ramen eateries in Vancouver. At the media tasting, we tried the Basic Shoyu, Basic Spicy Miso, Traditional Hida Chuka, and Tantanmen White Sesame. I enjoyed how light the broths were but still nicely flavourful. The noodles were thin but fairly al dente while the chashu was tender. The ramen eggs were perfect with a firm, but runny yolk. Portions to price were very reasonable for the neighbourhood. My favourite was the Tantanmen White Sesame featuring Hida Signature broth, spicy ground pork, pickled ginger, green onion and black fungus. 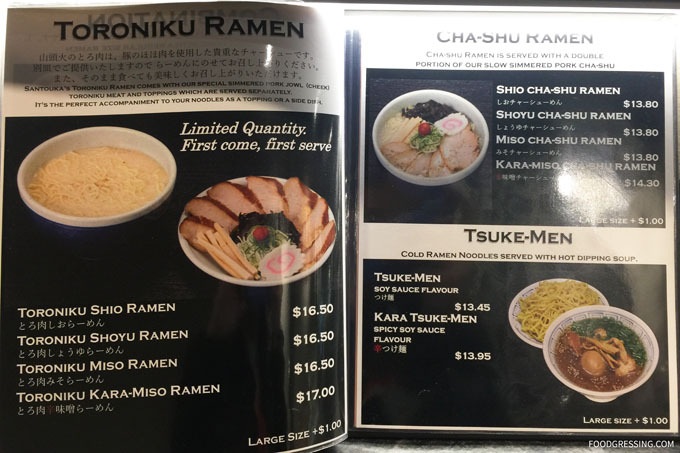 It’s the most expensive ramen they offer at $12.75 and has more unique ingredients compared to your typical chashu, green onion and bamboo shoot. I liked that it had a bit of spiciness to it complimented with the nutty flavours from the white sesame. If you’re feeling bored with chashu, the spicy ground pork is a good reason to try. A favourite among media was the Basic Spicy Miso made with Hida signature pork broth. 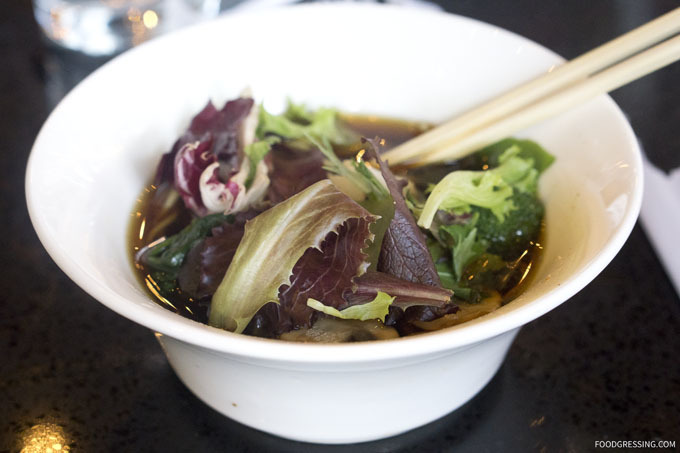 The Traditional Hida Chuka bowl was a lighter option that uses clear, chicken dashi broth. The Basic Shoyu was a solid option for a very basic bowl of ramen. 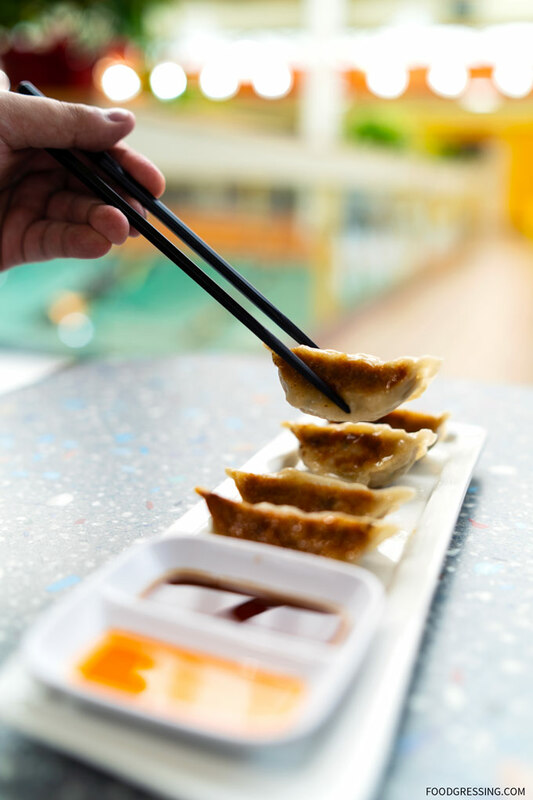 The house-made gyoza had a flavourful and tender pork filling. I did wish the wrapping was a bit more crisp and that filling was more piping hot. 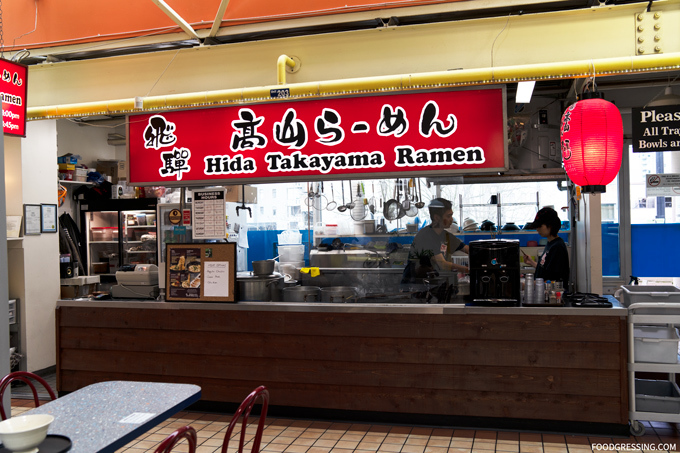 Hida offers good, affordable and hearty (yet not too heavy) bowls of ramen for the neighbourhood. It’s an unpretentious meal inside a food court but it’s satisfying for what it’s worth. Pro tip: Customers can enjoy two hours of free parking while at the mall! As a West End resident and foodie, I am very privileged to be able to regularly dine at some of the top ramen spots in the city. 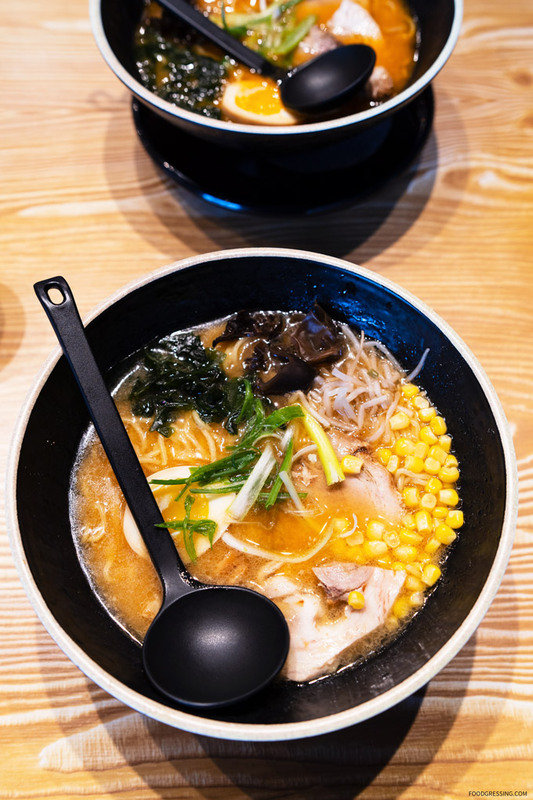 At the same time, it irks me sometimes to visit, experience and write about new ramen restaurants that open in the area where competition is stiff. 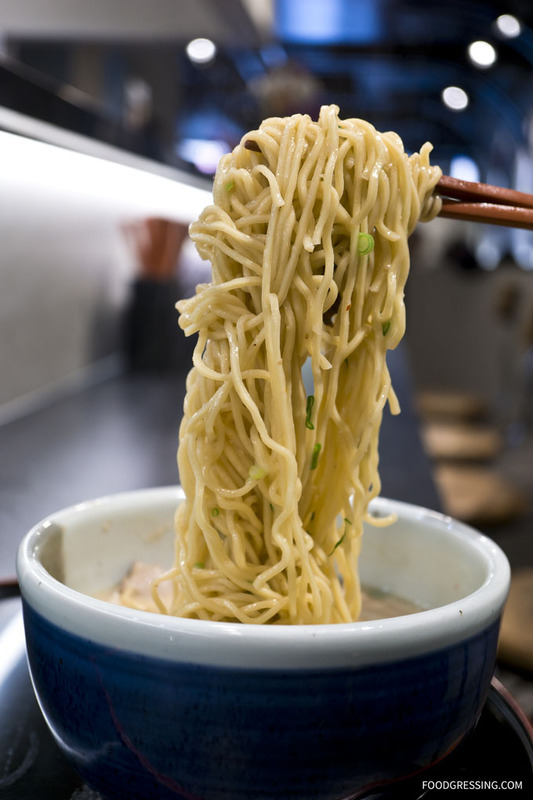 Take for example two ramen restaurants in the West End, Touhobenku and Menokura, which opened up and closed within a year or two. 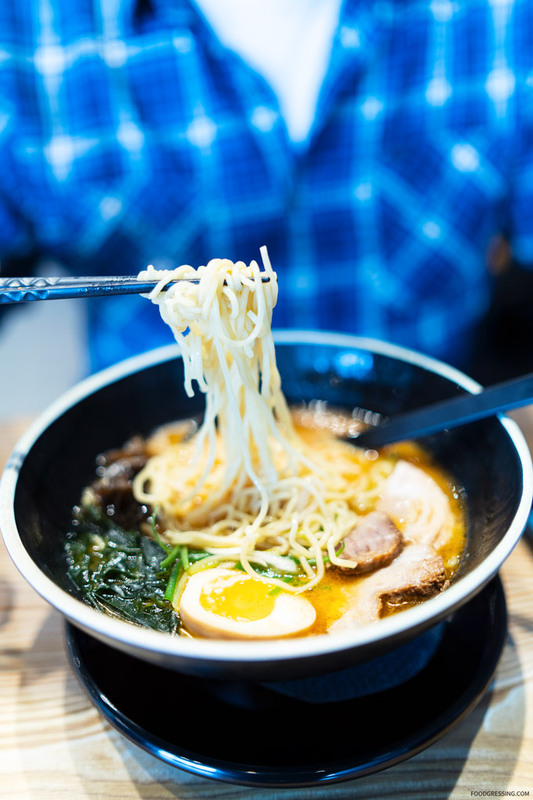 Vancouverites know a good ramen and they will keep returning if it’s good. 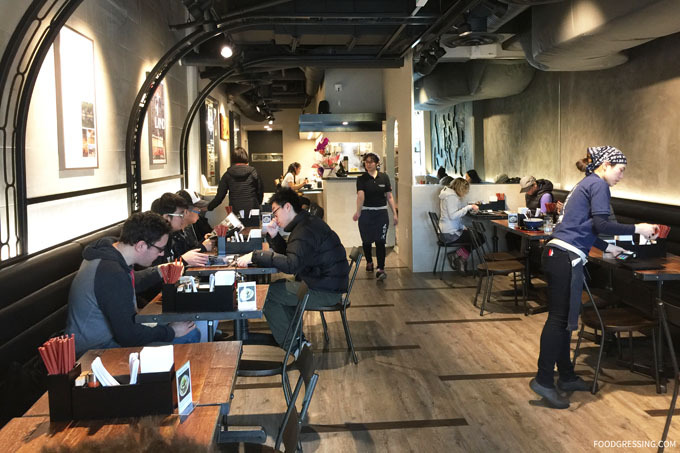 If a ramen restaurant can’t manage to draw customers, the downfall is swift. 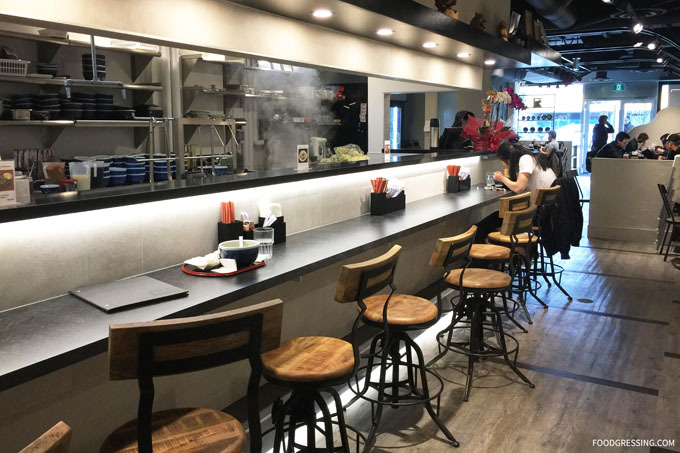 The latest entrant to the competitive ramen scene in Vancouver is Hokkaido-based, Ramen Taka, at 841 Bidwell Street (off Robson Street). 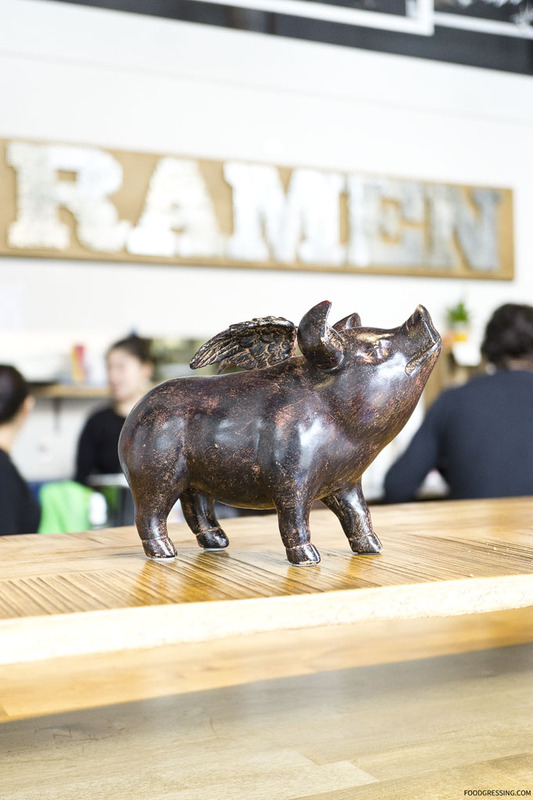 They take over the space formerly occupied by The Ramenman, which has since moved to Davie. 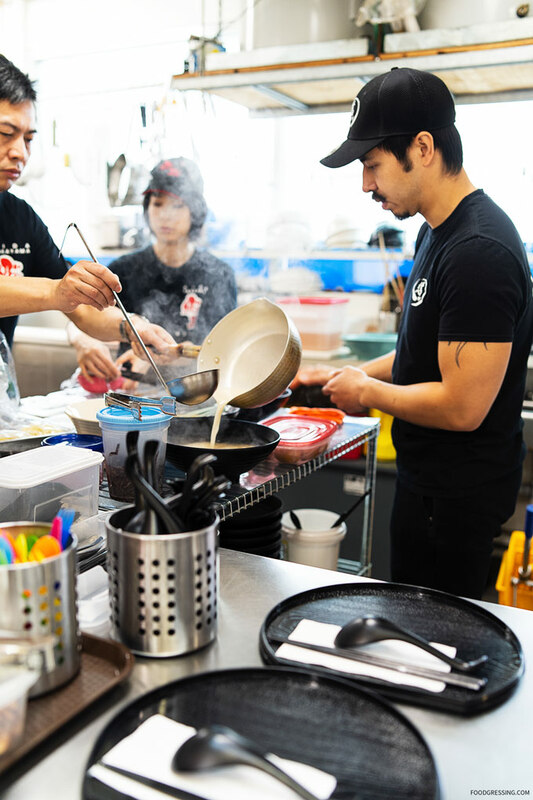 Ramen Taka has five locations in Japan and this new Vancouver restaurant is their first international venture. 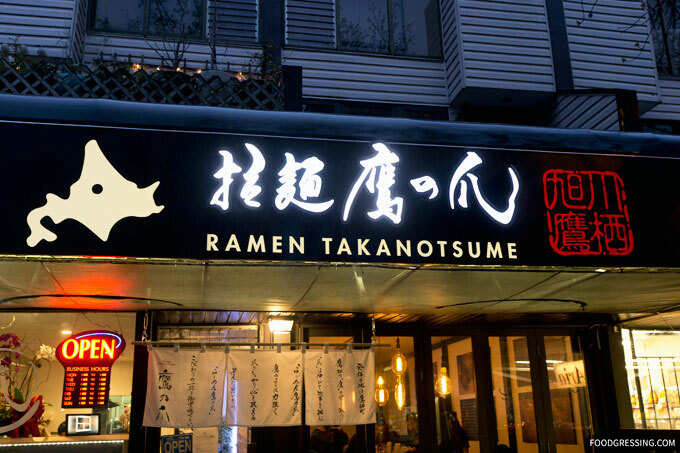 Ramen Taka specializes in Asahikawa-style ramen which is known for shoyu (soya sauce based) broth that consists of a blend of pork, vegetable and seafood. The broth of Asahikawa ramen has the characteristic of being quite oily, and there is often a thin layer of oil on top of the soup. And yeah, oily it was (more on that later). 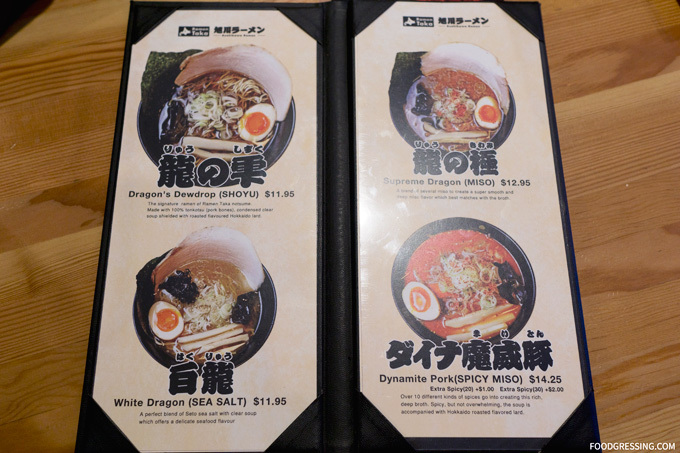 On the menu, you will find 5 types of ramen: Dragon’s Dewdrop (shoyu), White Dragon (sea salt), Supreme Dragon (miso), Dynamite Pork (spicy miso) and Vegan Ramen (miso). 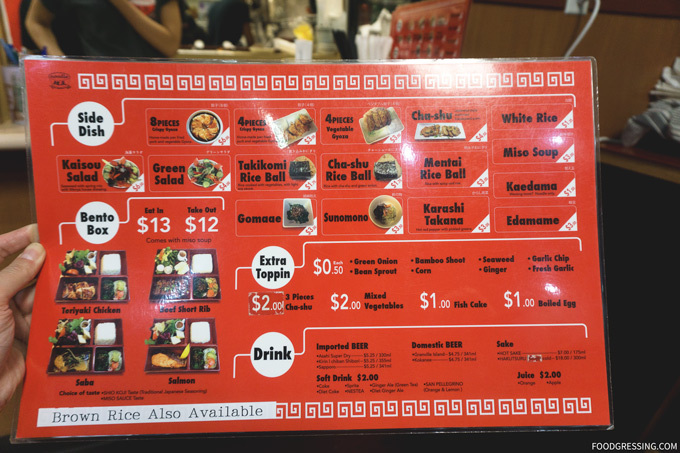 Customers can order extra toppings like green onion, corn, seaweed, chashu and more. 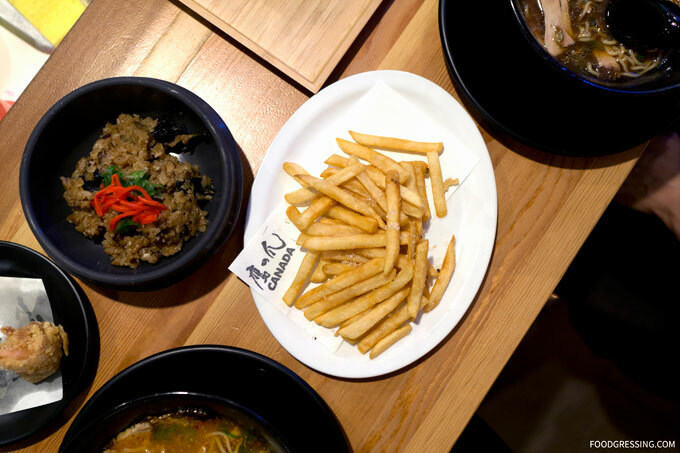 There are just a few side dishes including chicken karaage, gyoza and French fries. Their Grand Opening is today (April 9) and they will start to offer a special dinnertime menu. 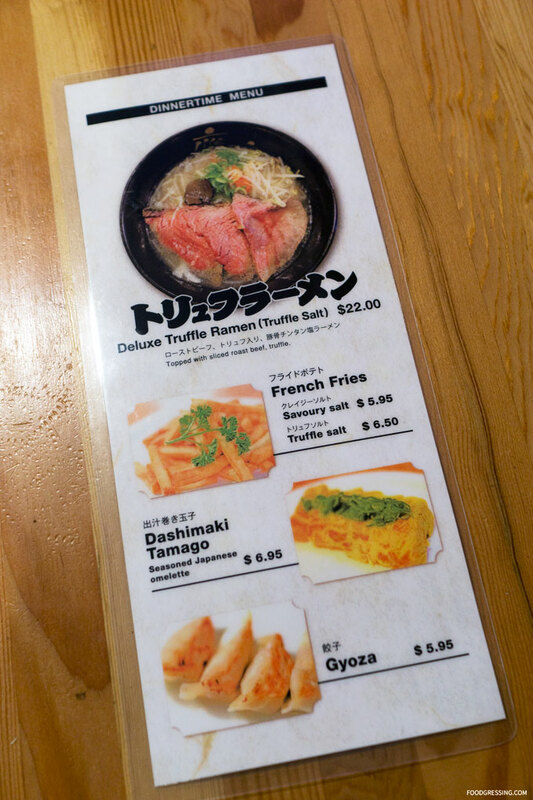 What stood out on the dinner menu was a Deluxe Truffle Ramen with sliced roast beef and truffle salt. 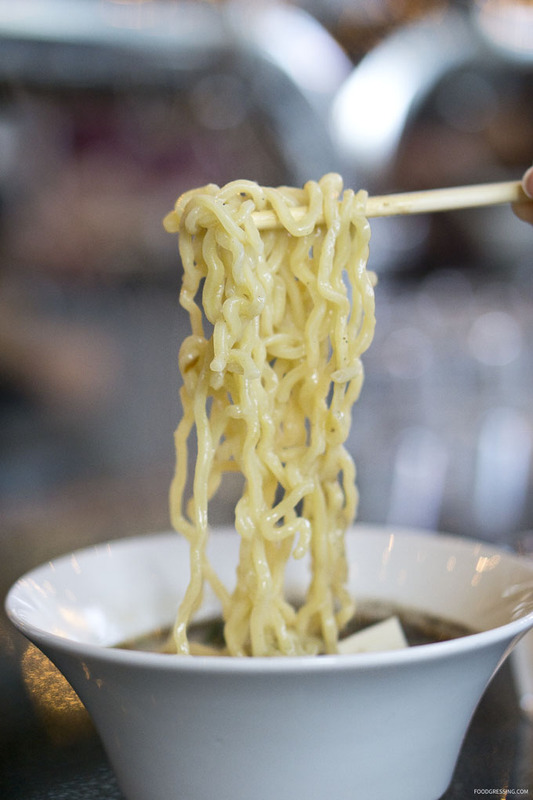 This is probably the most expensive ramen out there in Vancouver as it is priced at $22. 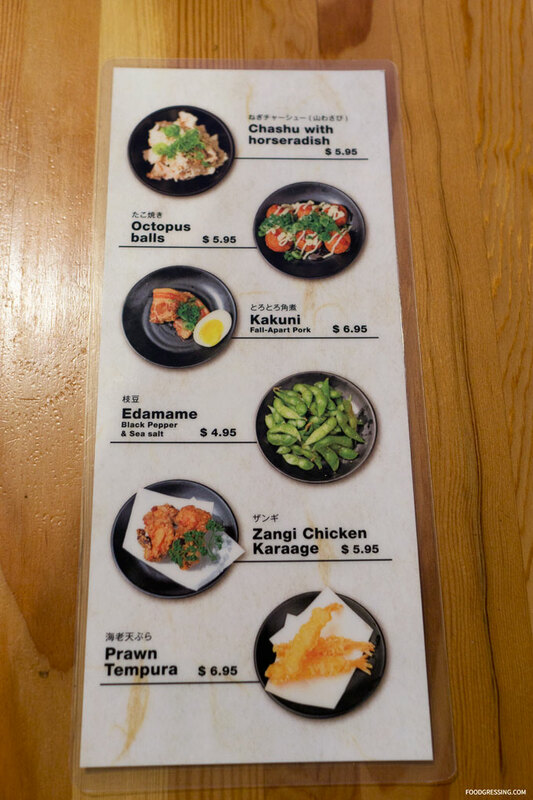 The choices for side dishes also have expanded with the dinnertime menu and include French Fries (with savoury or truffle salt), Dashimaki Tamago (seasoned Japanese omelette), chashu with horseradish, octopus balls, and so forth. 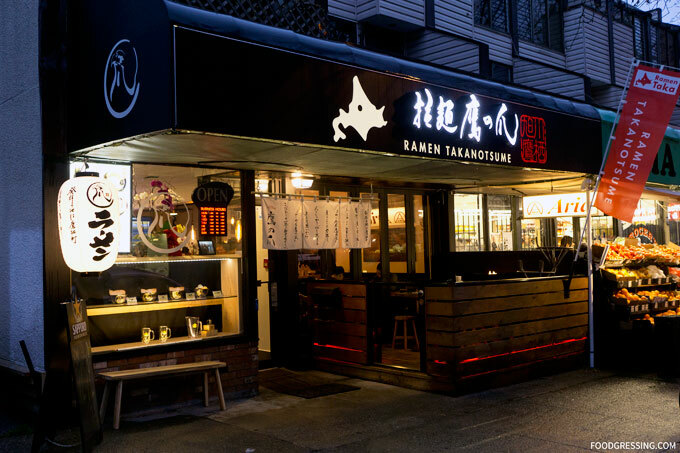 Ramen Taka seems to have retained the same vibe and layout as The Ramenman. A hipstic-chic sort of place with a few dining tables at the back, a large communal table in the middle, and counter seating by the kitchen. My friend and I visited Ramen Taka last night as she was interested in trying them out after seeing David’s Instagram post from his media tasting. Disclosure: We visited Ramen Taka as regular customers but the chef end up offering us a few more side dishes to try on the house. 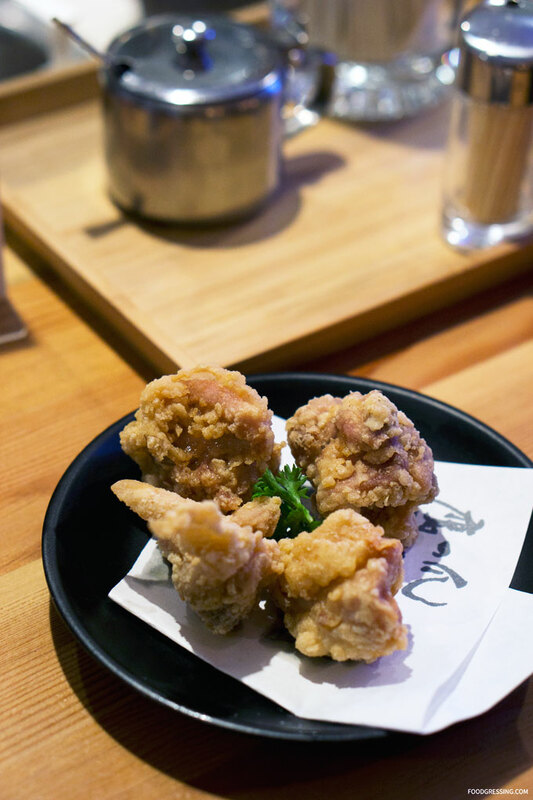 We started off with a 4-piece chicken karaage starter ($5.95). Unfortunately, the karaage missed the mark with me as the batter wasn’t particularly crispy and the inside was not very juicy or tender. The karaage pieces weren’t particularly big either. I would not order this again. This dish featured seasoned rice mixed with chopped chashu and mushrooms. The chef offered this as a complimentary tasting but it is regularly $5.95. The texture and flavour of the dish was reminiscent of Chinese sticky rice, No Mai Fan. It is too bad that it stand out for me in terms of flavour. Another complimentary dish from the chef was the French Fries with Truffle Salt ($6.50). The fries were nicely crispy but I didn’t feel like the truffle flavours came through. It tasted largely of sea salt for me. My friend had the Dragon’s Dewdrop (Shoyu) ($11.95) with a clear broth made from pork bones. The Supreme Dragon Miso ramen was just an OK for me ($12.95). The clear broth wasn’t particularly rich or flavourful to me but rather oily and salty. The broth was largely not that drinkable; the saltiness resulted me needing to drink lots of water for the rest of the night. The ramen egg had a nicely runny yolk. The chashu was lean – not super melt-in-your-mouth – but was decent portion. Noodles weren’t particularly al dente in my opinion. Portions overall seemed average for the price. 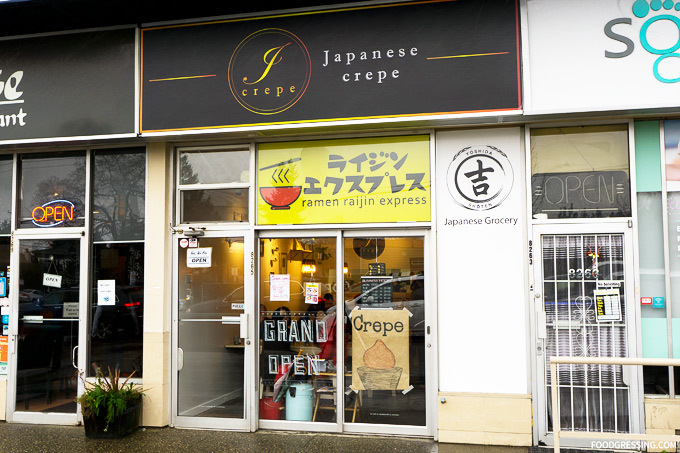 Newly opened in the Marpole Area is a 3-in-1 establishment – a Japanese grocery store/crêpe and ramen eateries – by the Zakkushi Group. 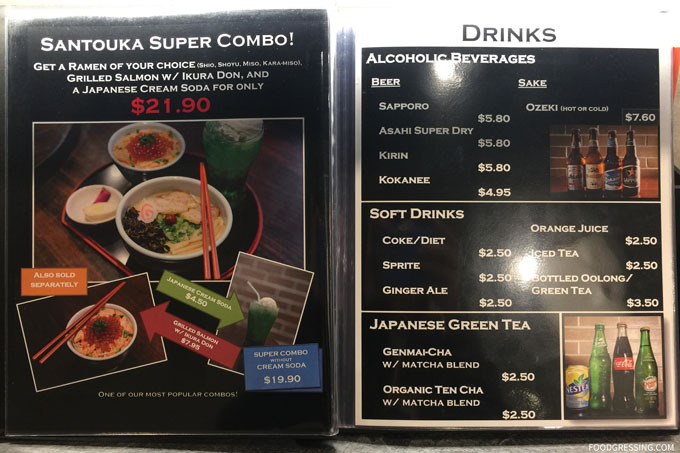 At 8265 Oak Street, you’ll find Yoshida Shoten (Japanese grocery store), J Crepe (offering Japanese crepe) and Ramen Raijin Express (offering late night ramen). I had heard about them via Daily Hive and decided to take advantage of their $5 crêpe deal (until Jan 31) to try some of their offerings. What is unique J Crepe is that their crêpes are made with bamboo charcoal batter. Charcoal is a rather hot wellness trend this year as it is reported to have a detoxifying effect on the body. 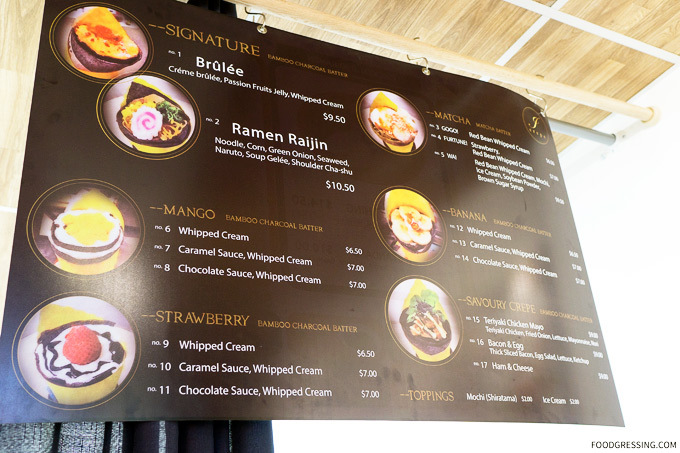 J Crepes offers 17 different types of crêpes between $6.50 – $11. 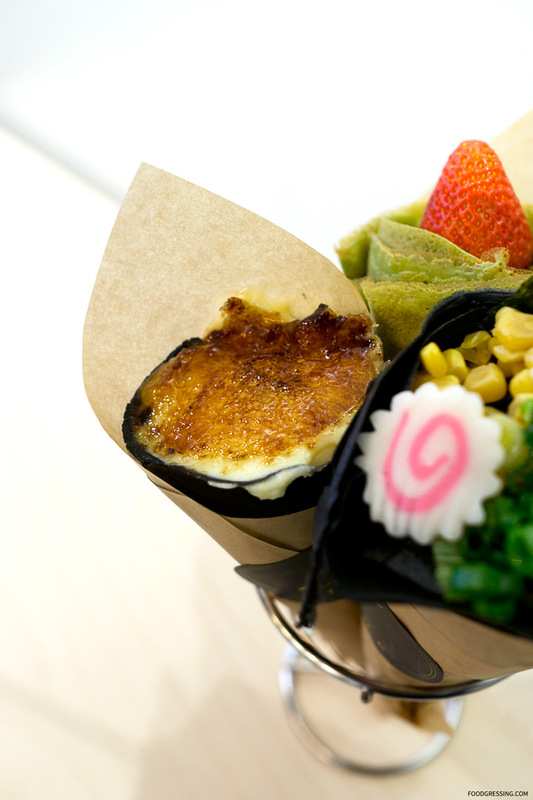 Their signature savoury crêpes are the Ramen Raijin (ramen in crêpe) and Brûlée (crème brûlée in crêpe). Other savoury crêpe options include Teriyaki Chicken Mayo, Bacon & Egg, and Ham & Cheese. 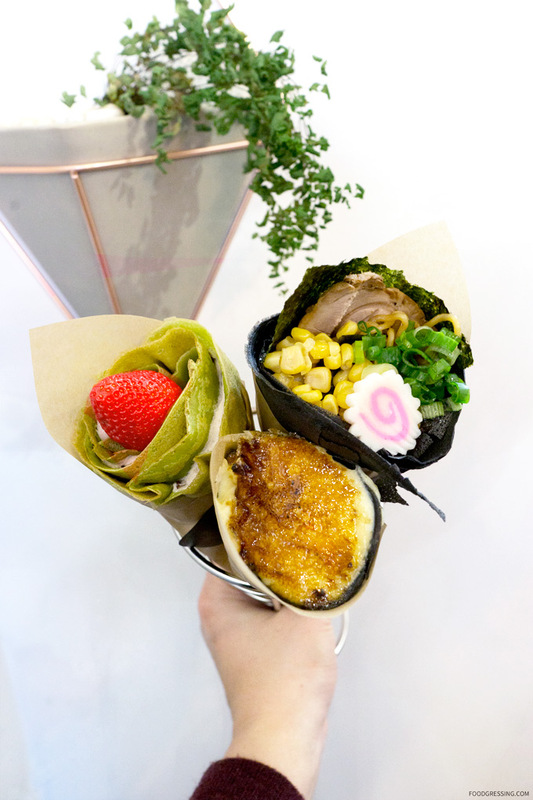 Sweet crêpe options include Mango, Strawberry, Matcha (with Matcha batter) and Banana. At this new Zakkushi Group establishment, they have Japanese snacks for sale including some in a freezer (like ice cream & mochi). There are just two communal tables for eating in. The potted plants and overhanging industrial lights add to the charm. Note: None of the food in this review were complimentary. This review is done anonymously. The $5 crêpe deals are on until January 31 and apply to all their crêpe items. My husband I tried the Ramen Raijin, FURTUNE! and Brûlée. The sweet crêpes fared better than the ramen crêpe starting with the Brûlée. It had crème brûlée, passion fruits jelly and whipped cream. The custard was torched on order and I enjoyed the beautifully caramelized top. The custard was also wonderfully smooth and creamy. I would love to have this again. The FURTUNE! crêpe was made with matcha batter and had fresh strawberries and red bean whipped cream for the filling. The red bean whipped cream was the highlight for me. It had just the right amount of sweetness and red bean flavour; I also liked how there were red bean bits in it. I would love to have this again as well. I thought the staff were very friendly despite the busy lineup of customers. They only have one crêpe grill so there might be a bit of a wait but your order. However, staff seemed to be getting the orders out in a reasonable amount of time. 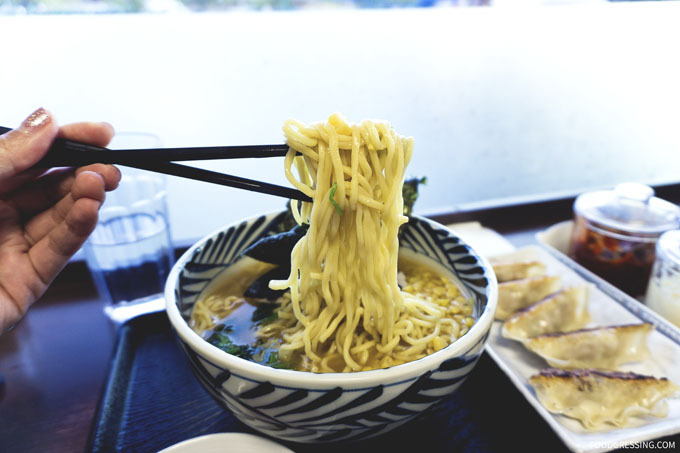 A while back, Scout Magazine had conducted a poll of best ramen houses in Vancouver. My two favourite places, Marutama and Ramen Butcher, ranked first and second place. 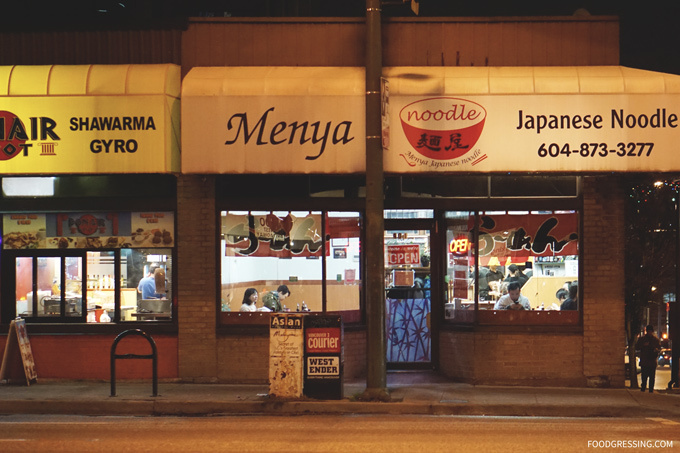 But rounding out the top 10 was Menya Ramen, one of the older ramen houses in Vancouver which is located along the Broadway-Cambie Corridor. I hadn’t been to Menya before but have tried two other ramen houses in the same area (Hokkaido Santouka and Benkei Ramen). After seeing it being named on Scout Magazine’s list, I was eager to try Menya Ramen out. The opportunity came up when a few friends and I were still hungry after an event so we decided to wrap up the evening with warming, comforting bowls of ramen. Note: None of the food in this review was complimentary. This review is done anonymously. Opinions are my own. Menya Ramen seemed like a humble, hole-in-the-wall sort of place. The interior was modest, minimal but with some rustic influences particularly the wooden stumps used as stools. It seemed like a stark contrast to the contemporary dining space of Hokkaido Santouka just two blocks away. 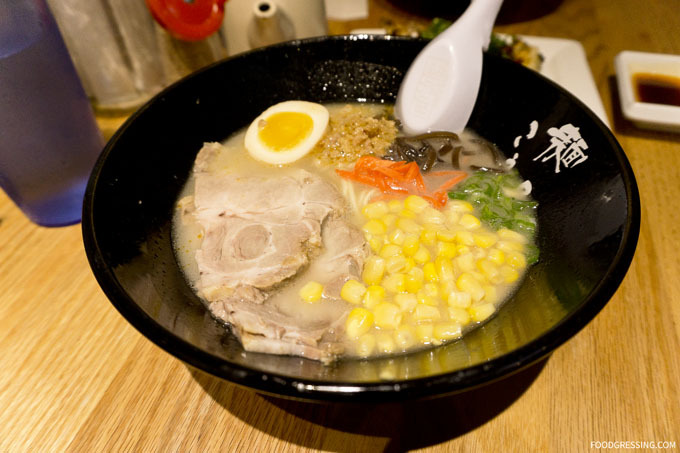 Menya specializes in Tonkotsu style ramen featuring thick, milky pork-bone broth. 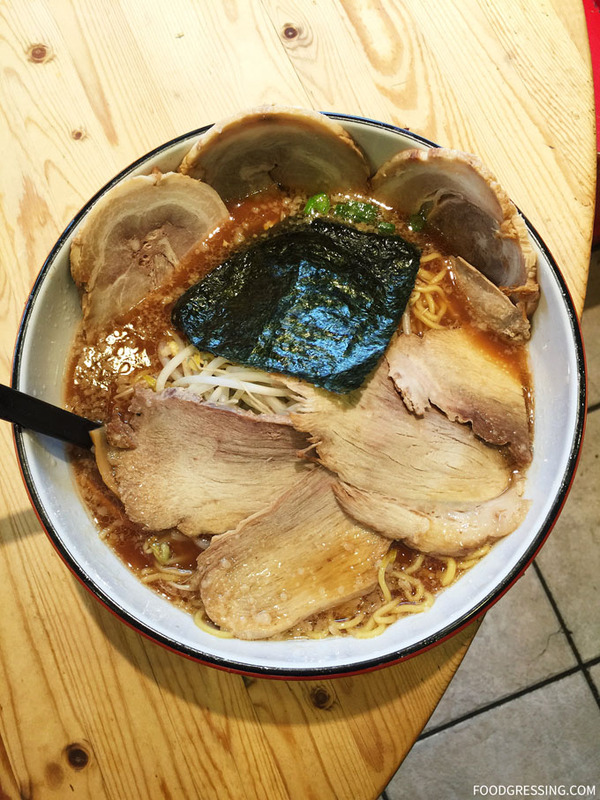 Their house specialty ramen is the Nagahama Ramen which has pork bone soup with special soy sauce seasoning. 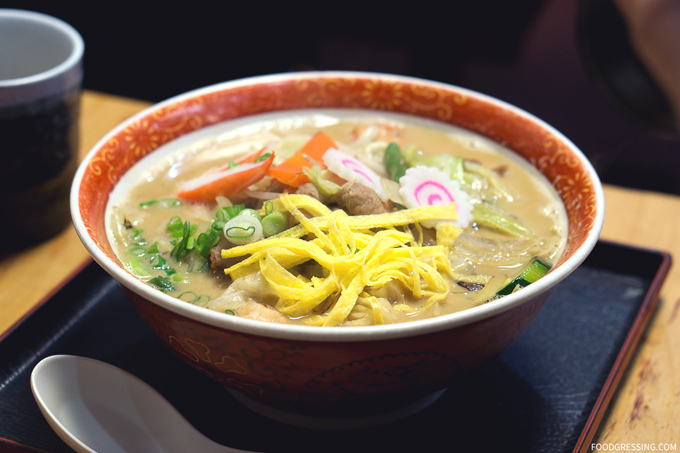 Other ramen varieties offered include Tonkotsu Miso, Nagasaki, Shoyu, and Veggie Miso. On the menu also are Udon, Don (rice bowls), Bento Boxes and sides like gyoza, rice balls and salads. 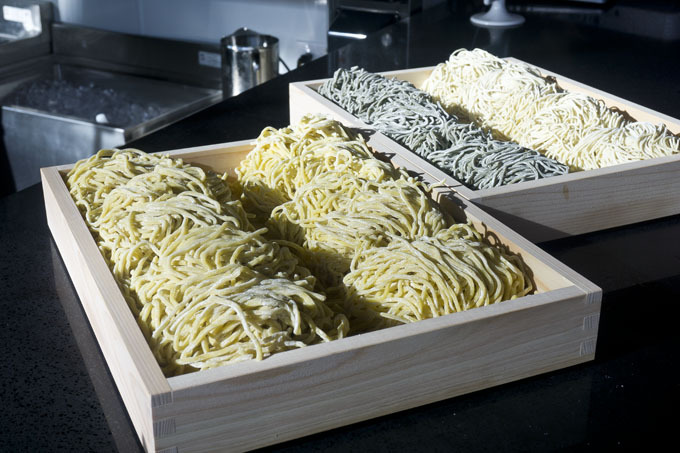 Customers can choose the noodle thickness (thin, regular, thick) and type (udon, soba, rice). 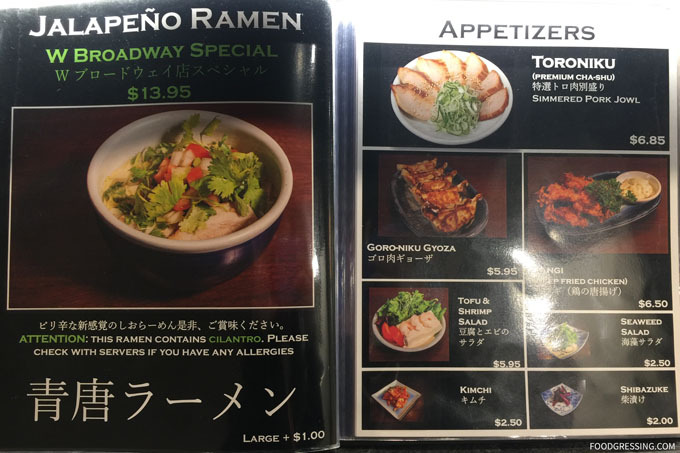 The main dishes are essentially $10 or less which appears to be a lot more affordable than other ramen houses where I have spent almost $20 for a single bowl of ramen. 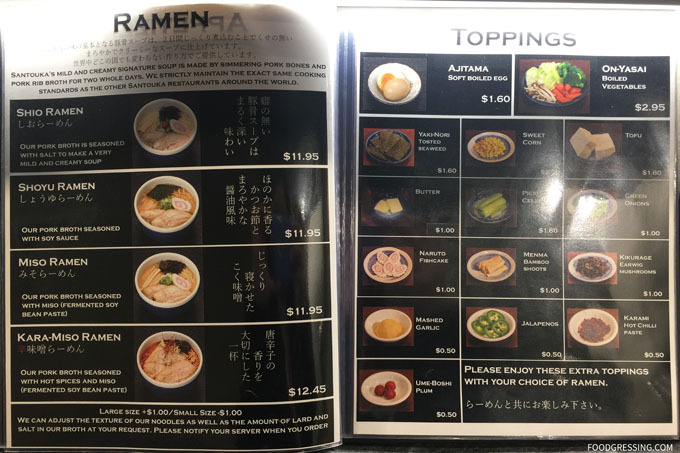 I also noticed that the toppings were a lot cheaper compared to other ramen houses. 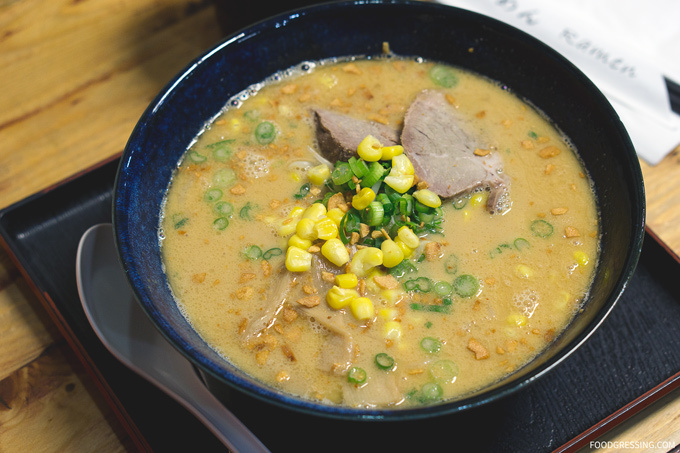 I like to get extra corn which cost $0.50 at Menya. At Santouka, I have actually paid $2.20 (eek!). I went with a Tonkotsu Miso Ramen ($8.50) with extra corn ($0.50). It took less than 10 minutes for the bowl to arrive after putting in the order. The bowl was wonderfully hot when it came to the table. I chose thin noodles and found them to reasonably al dente. The broth was mildly flavourful, fairly creamy, but too salty. One friend concurred that her broth was too salty for her liking as well. It was the kind of salty where you know you’ll be drinking a lot of water for the rest of the night. My other disappointment was the corn. 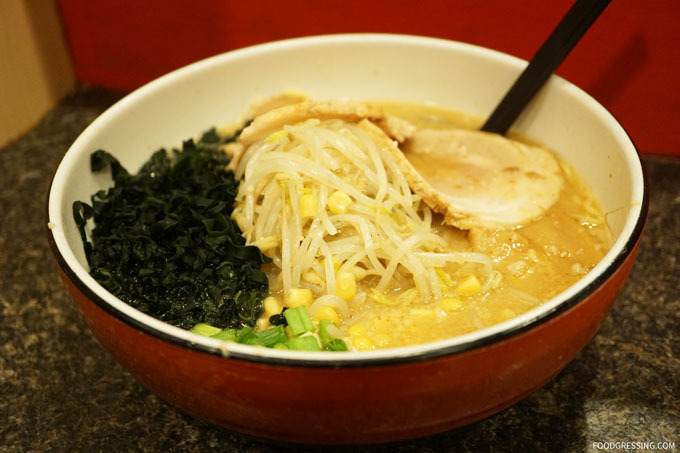 Now I really love corn with ramen and really appreciated that Menya Ramen charges only $0.50 for an extra topping. However, the corn they gave was not sweet at all and hard! Really poor quality and perhaps too old? It made me wish I brought my own canned corn to the shop. Portions were very reasonable for the price but the quality of the ramen (and corn) just didn’t quite meet my expectations. One friend had the Nagasaki Chanpon, which is the most expensive ramen on Menya’s menu ($10.50). It had quite a mix of ingredients including vegetables, seafood, meat and noodles – all in one bowl! 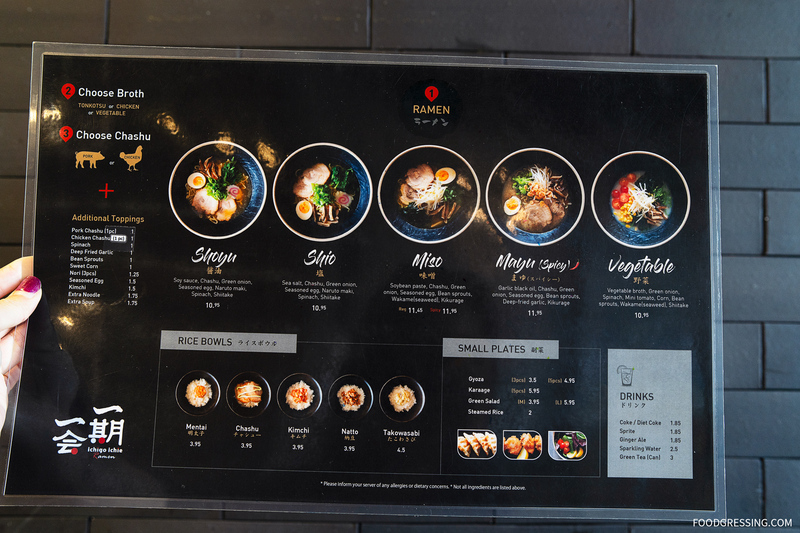 While most of the top local ramen eateries are in Downtown Vancouver, a new ramen house has emerged in the Metrotown area. 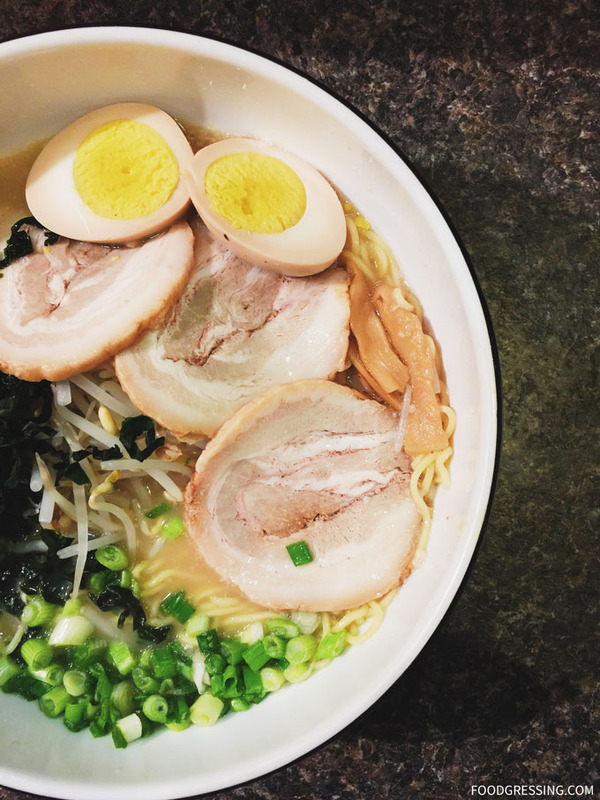 Meet Yaguchiya Ramen which originates from Yokohama, Japan and now has opened their first overseas location in Burnaby a few months ago. 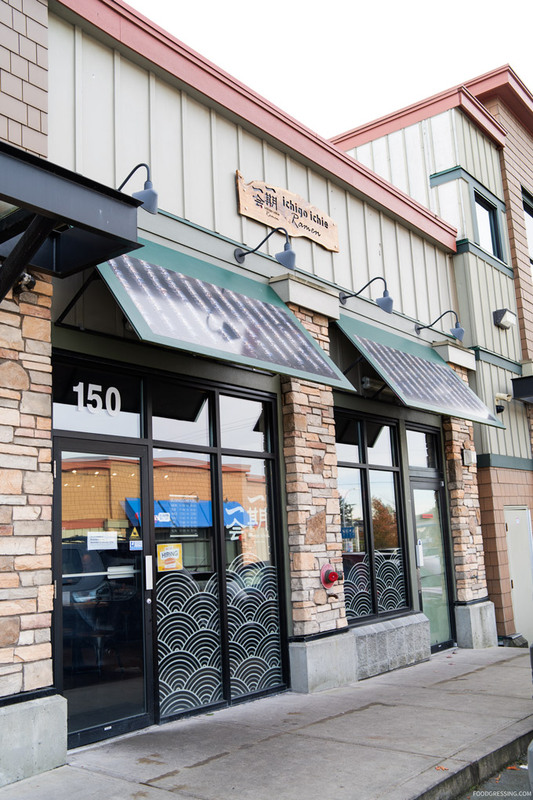 Yaguchiya is conveniently located on Kingsway right across Superstore at Metrotown so it’s easy to access from the mall. 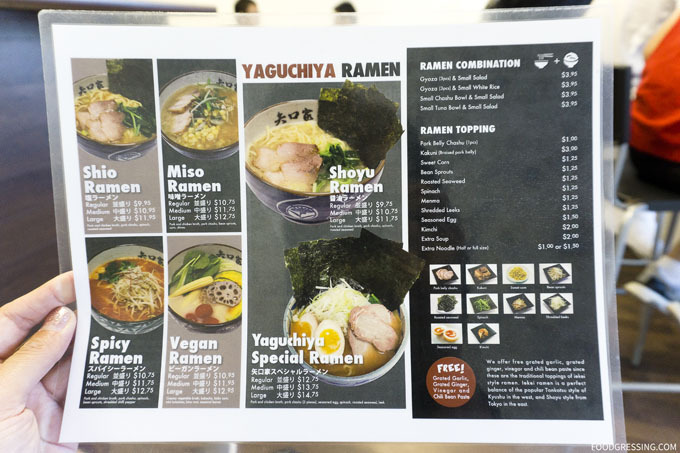 A friend and I decided to try out Yaguchiya Ramen recently after attending a media preview of the new MUJI store at Metrotown. 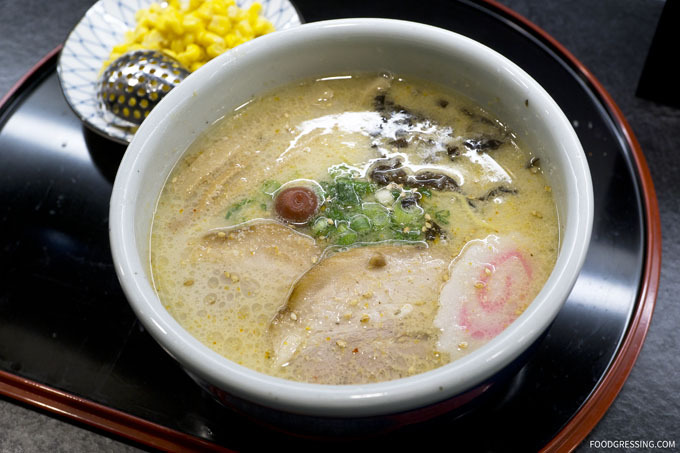 Yaguchiya specializes in Iekei ramen, a unique hybrid ramen style that combines chicken and soy-based shoyu ramen with tonkatsu or pork bone-style ramen. Iekei-style ramen is fairly uncommon outside of Japan where it was invented in Yokohama during the 1970s. The resulting Iekei broth is lighter than fatty, creamy tonkotsu but heavier than shoyu which is thin. 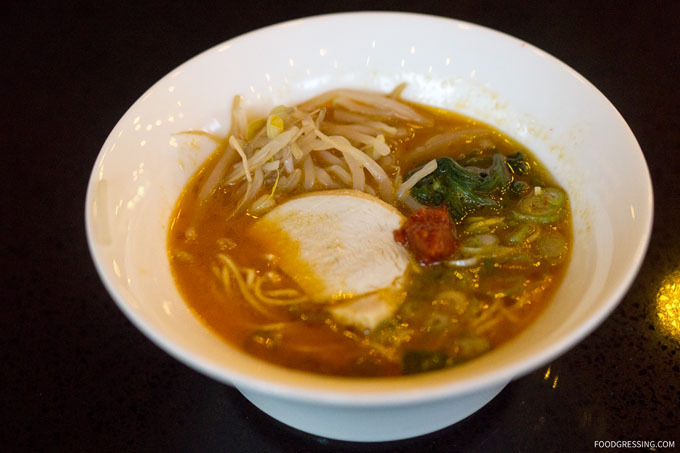 On the menu are 6 main ramen features: Shoyu, Shio, Miso, Spicy, Vegan and Yaguchia Special. The bowls come in regular, medium or large and range between $10-$15 depending on the flavour and size. 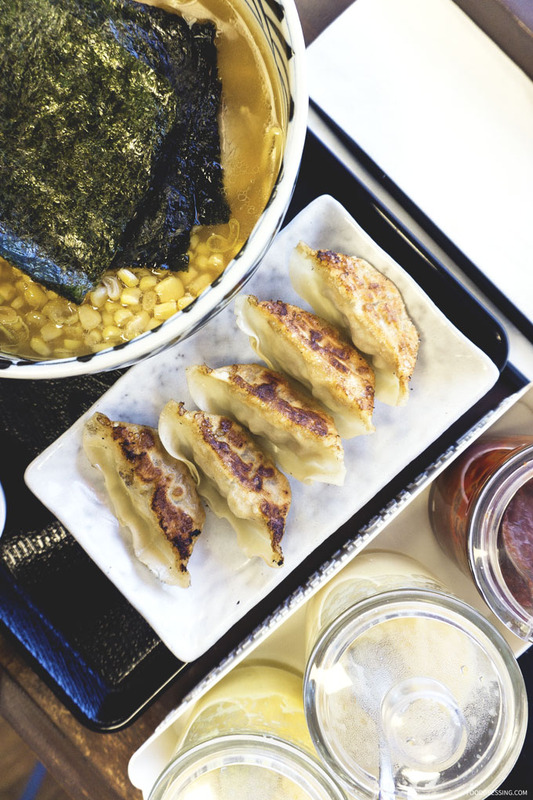 They offer ramen combos with gyoza and salad or you can order those as stand-alone side dishes. A few rice dishes and desserts round out the menu. 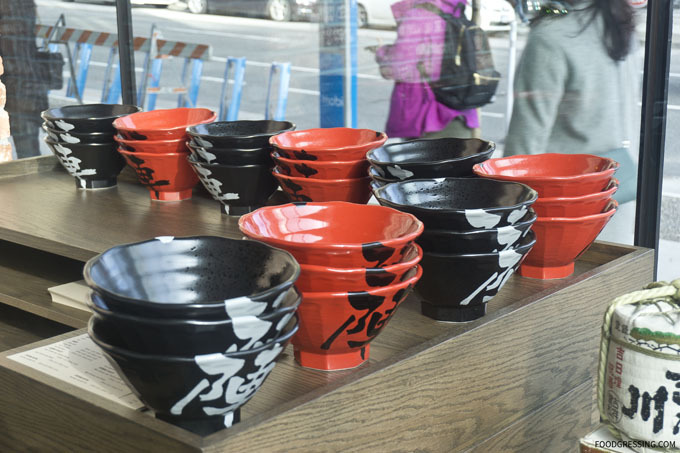 The bowls are customizable based on noodle firmness (soft or hard), taste (mild or strong) and oil (little or a lot). You can view the menu online here. Yaguchiya has a recommended recipe of toppings which includes a dash of pepper, garlic, spicy miso, grated ginger and a dash of vinegar. The interior of Yaguchiya ramen was small, bare minimal but very brightly lit and quite unlike most of the ramen eateries I have been to in Vancouver. There were a few four-person tables and seating at the counter along the window. 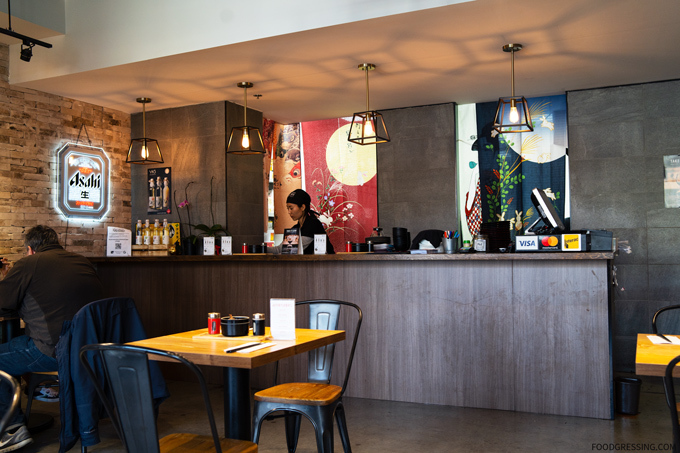 The kitchen is closed and is located at the back of the restaurant which is a contrast to a place like Kintaro where you can watch the chefs at work. I went with a medium shoyu ramen ($11.75) which had chicken and pork broth, 2 pieces of pork chashu, roasted seaweed, spinach and an extra topping of sweet corn ($1.25). I forgot to customize my bowl for the noodles, taste and oil nor did the server ask. As a result, I’m not quite sure what the standard options are. I found Yaguchiya’s pork and chicken broth fairly light, golden in colour and definitely more opaque and less flavourful than a milky, creamy tonkotsu broth. The portion of corn given (as the additional topping) was reasonable for $1.25. I’ve paid double for the same amount at Santouka. The noodles weren’t particularly al dente – perhaps they were soft noodles. The portion of noodles given were more than reasonable. You will get filled because of that. The pork chashu was disappointing. The two pieces I received were very thinly sliced, tough and definitely not melt-in-your-mouth. We also ordered a side of gyoza to share. Unfortunately, the gyoza weren’t particularly good either with the filling being just average and the outside wrap not so crispy. The gyoza weren’t piping hot either but rather just adequately warm. My friend had the regular Yaguchiya Special ($12.75) which comes with 3 pieces of chashu, seasoned egg, leek, roasted seaweed, spinach in a pork and chicken broth. 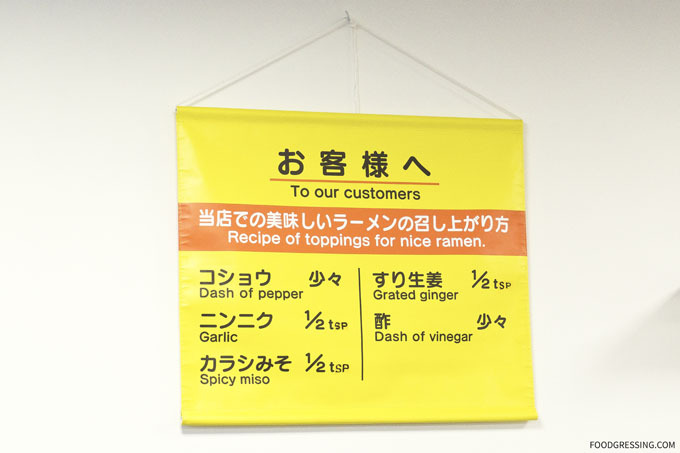 It had been over two years since my first and only visit to the Ramen Butcher in Chinatown (see review here). At that time, they had just opened and I went to take advantage of their grand opening special of $5 ramen. Since then, I have eaten at various new and old ramen establishments around Metro Vancouver (see tag ramen) and most recently at the newly opened second location of Santouka on West Broadway (see review here). At Santouka, I had spent about $17 for a single bowl of ramen which unfortunately wasn’t very filling. This sort of begs the question: where can I get a bowl of ramen at a reasonable price with satisfying taste and portions in Vancouver? 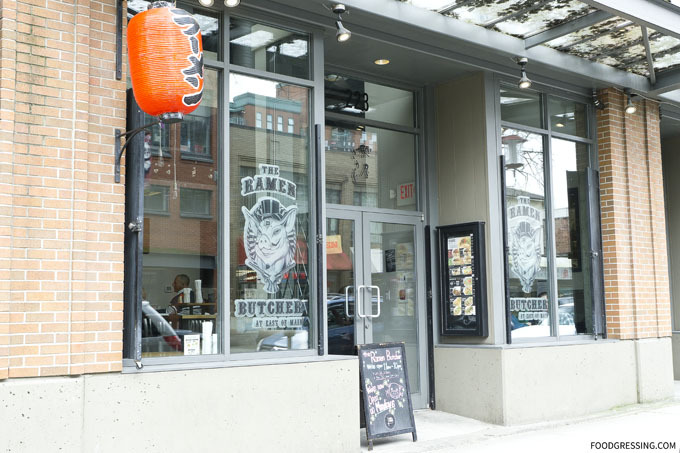 Scout Magazine conducted a reader poll of favourite ramen houses in Vancouver in which the Ramen Butcher was tied for top place with Marutama. I had in my mind some favourites but this prompted me to revisit to the Ramen Butcher. Note: None of the food in this review was complimentary. The restaurant did not know that I was a blogger. I was not sponsored for this review. 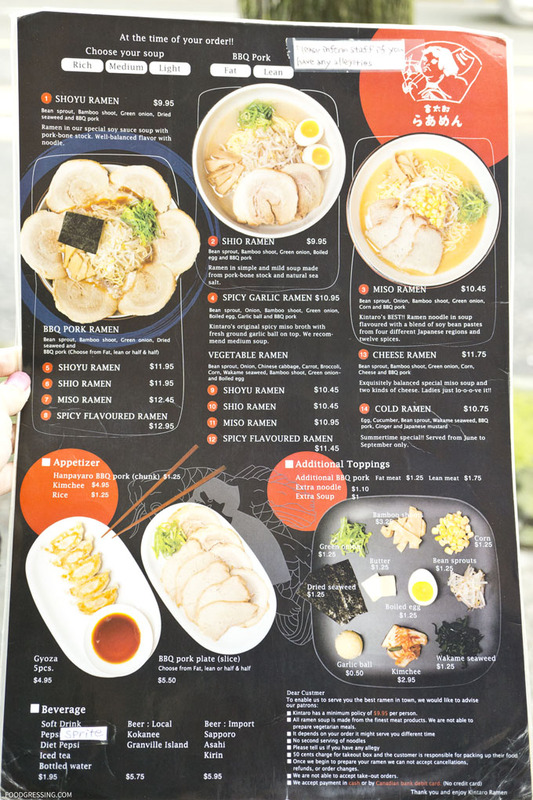 On the menu at the Ramen Butcher are classic tonkotsu ramen and variations with different sauces (red, black, green and orange). Bowls are priced around $10 – $12. Also available are mini donburi (rice) bowls including curry, chashu (pork), and karaage (deep fried chicken). For sides, there are different flavours of gyoza (original, cheese, spicy and okonomi) as well as karaage. 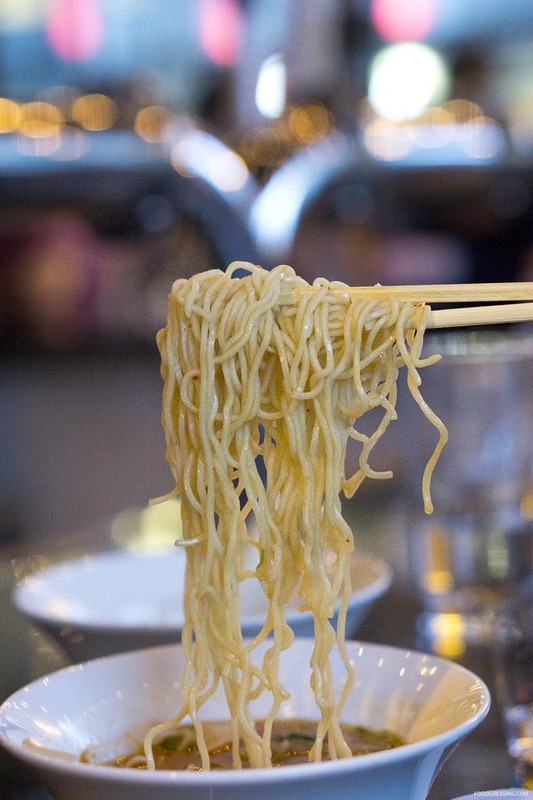 Customers can enjoy a free refill of noodles as long as you have enough soup left. The menu is fully available online. On my first revisit to the Ramen Butcher, I enjoyed a classic tonkotsuu (pork) broth ramen ($9.95) with an extra ramen egg (+$1.50) and corn (+$1.00). The pork broth was nicely flavourful and creamy while the noodles were al dente. The two slices of chashu was reasonably tender but not the most melt-in-your-mouth I have had. The extra corn was just $1.00 compared to the $2.20 charge at Santouka and the ramen egg had a reasonably runny yolk. Meanwhile, my friend had a Black ramen ($11.25) which has roasted garlic oil in tonkotsu broth and comes with a ramen egg. She seemed to enjoy her bowl as well. I went again to the Ramen Butcher on a separate occasion aftewards to have their Black ramen ($11.25). I was feeling extra hungry that day so I went for an extra egg (+$1.50) and 2 extra chashu pieces (+$2.00). While the ramen was solid, I do not know why I ordered so many extras because I was struggling to finish it all. Their chashu slices are fairly generous in size compared to Santouka. Disclosure: I was invited to a media event. All drinks and food in this review were complimentary. Opinions are my own. 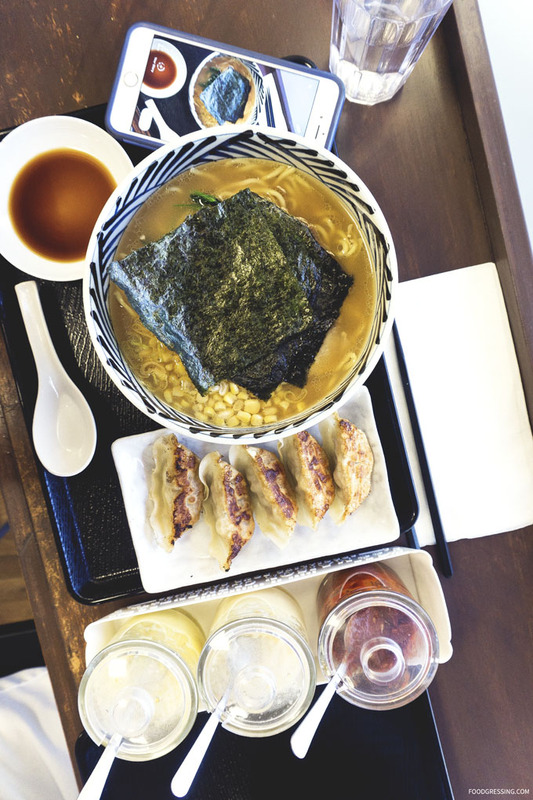 Jinya Ramen’s new menu features a wider selection of appetizers and sides. You’ll find salads (like spicy tofu and quinoa salads) and mini tacos (salmon poke and pork chasu & kimchee). 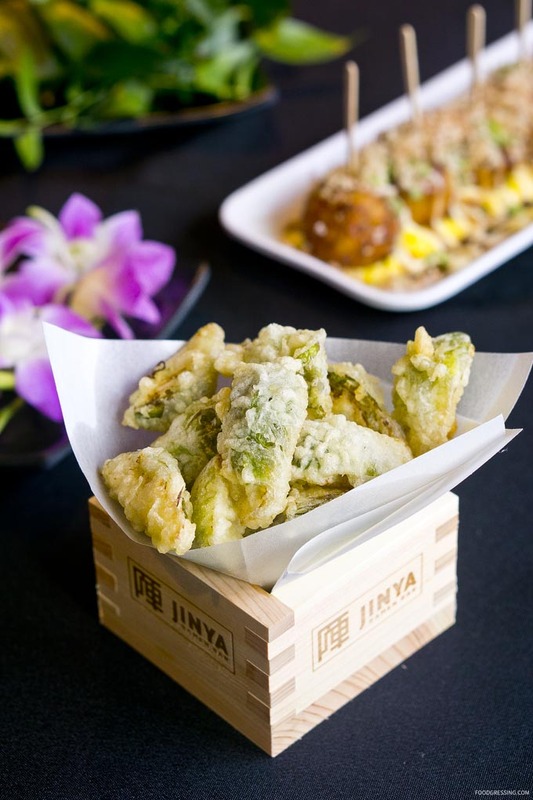 For small plates, some interesting offerings include spicy creamy shrimp tempura, steamed buns, brussels sprouts tempura, caramelized cauliflower and takoyaki. 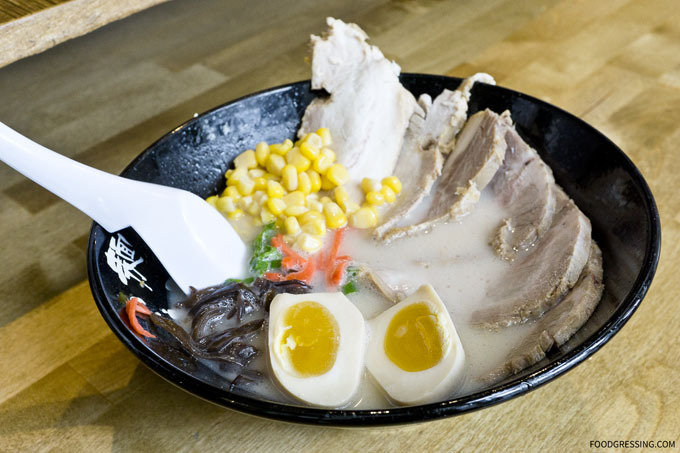 Ramen bowls items come in three types: Tonkotsu, Chicken and Vegetable. Jinya’s ramen broths simmer for more than ten hours for optimal flavour. 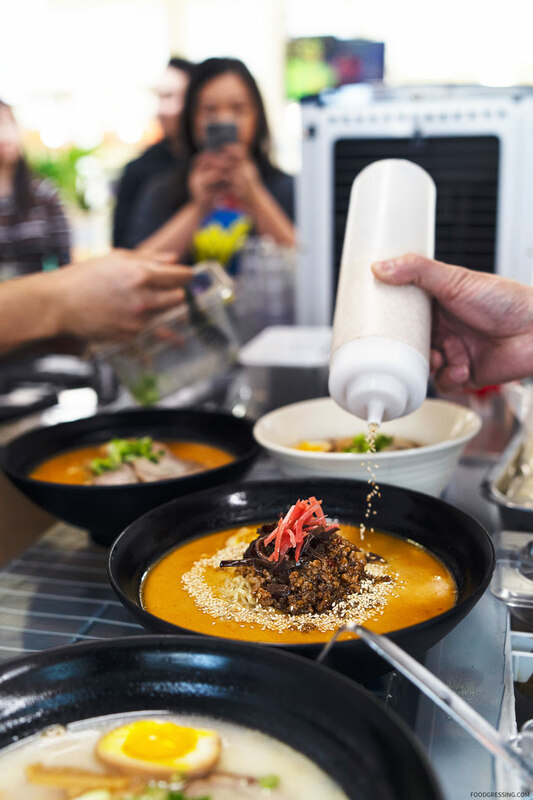 Tonkotsu options include Sprouting Up Ramen, Spicy, Black, White, Cha Cha Cha (garlic) and Spicy Umami Miso. For Chicken, there is regular, spicy, and wonton. 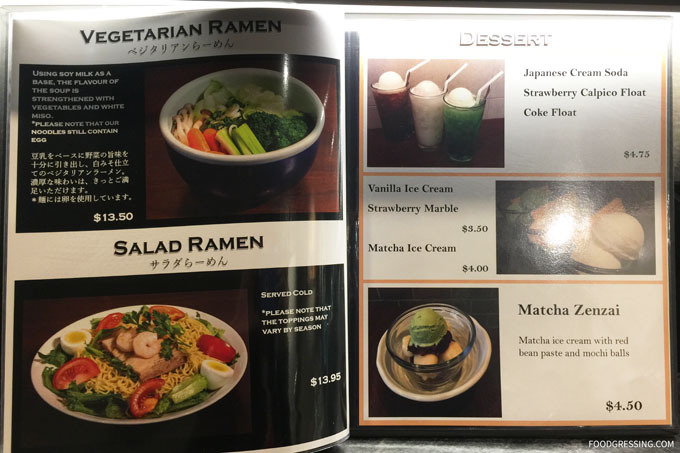 Vegetarian and Vegan ramen flavours are available. They also offer spinach noodles for an additional $2.00. Customize your bowl with additional toppings like wonton, mushroom, bok choy and more. The ramen bowls are priced $13 – $18 a bit on the higher end compared to other ramen houses in the city. Happy Hour is between 3pm – 5pm and includes a menu of salad, small plates, mini tacos and desserts. To finish off a ramen meal, there is also mochi ice cream and panna cotta for dessert. 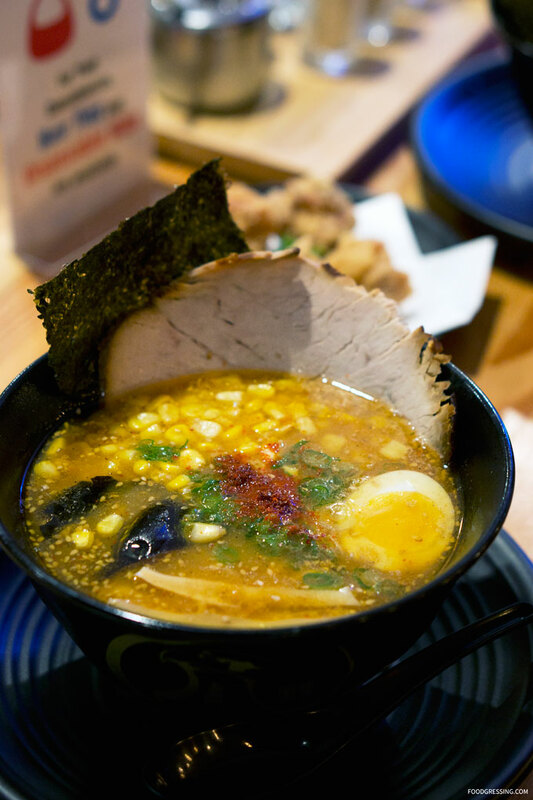 Jinya Ramen takes pride in that that their noodles are house-made. 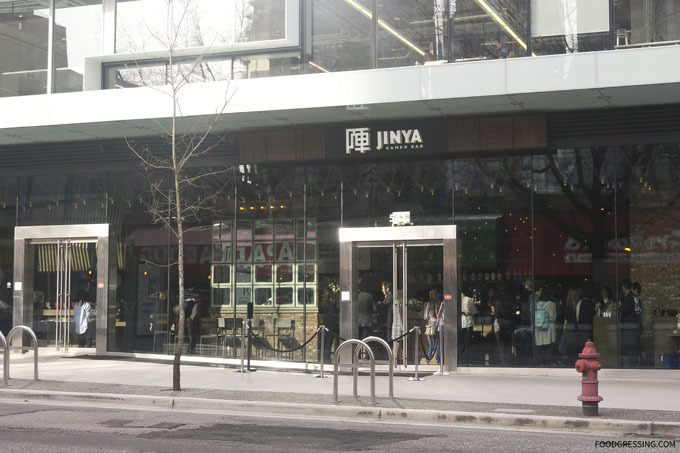 A main focal point in Jinya’s new space is the bar which is stocked with Japanese liquors as well as local beers. I very much enjoyed the Brussels Sprouts Tempura which were very addictive. They were crispy on the outside, tender on the inside and had white truffle oil. The Takoyaki (Octopus Balls) did not disappoint. 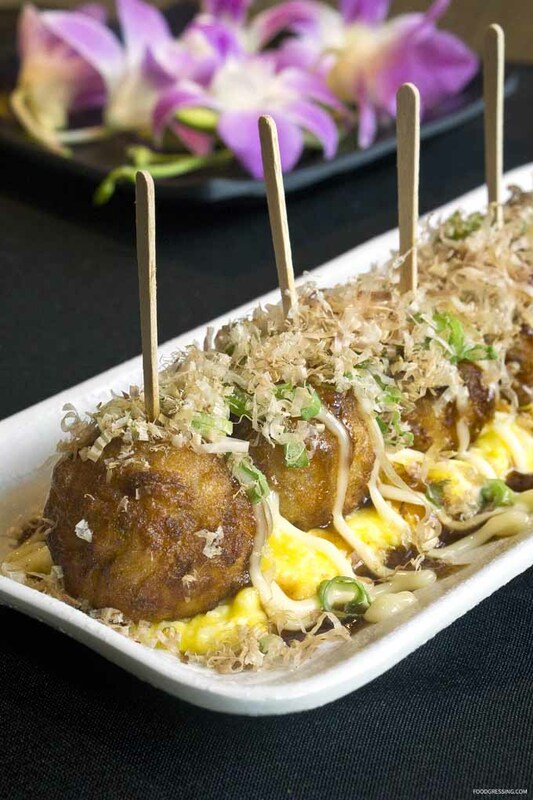 They were made by battering octopus with egg tartar, mayo, okonomiyaki, green onion and smoked bonito flakes. A little bit sweet and savoury, these deep-fried balls were melt-in-your-mouth scrumptious. 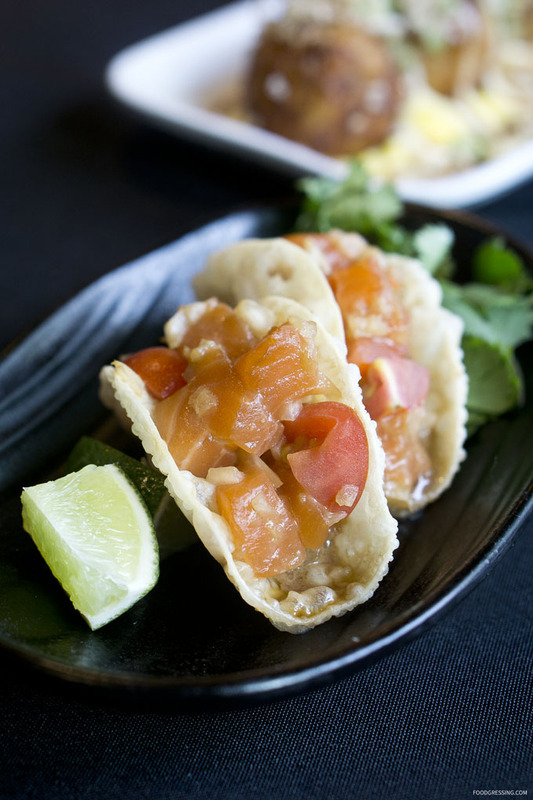 Also very good were the Salmon Poke Mini Tacos in a crispy wonton taco shell. The Tonkotsu Black is made with pork broth, pork chashu, spicy bean sprouts, kikurage, green onion, spicy sauce with thick noodles. 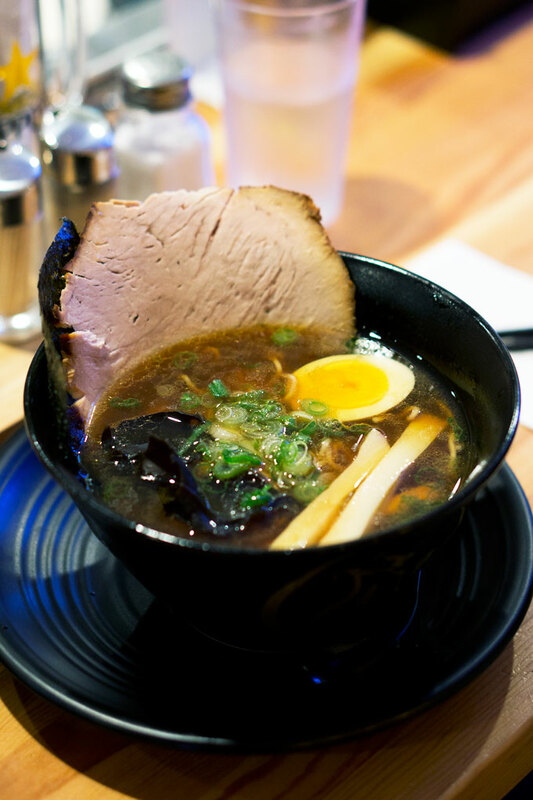 I enjoyed the rich, creamy flavourful pork broth with the melt-in-your-mouth delicious chashu. 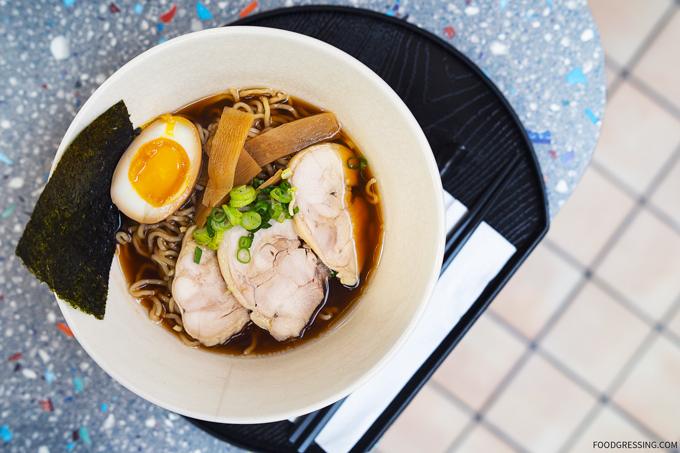 A classic ramen flavour that does not disappoint. 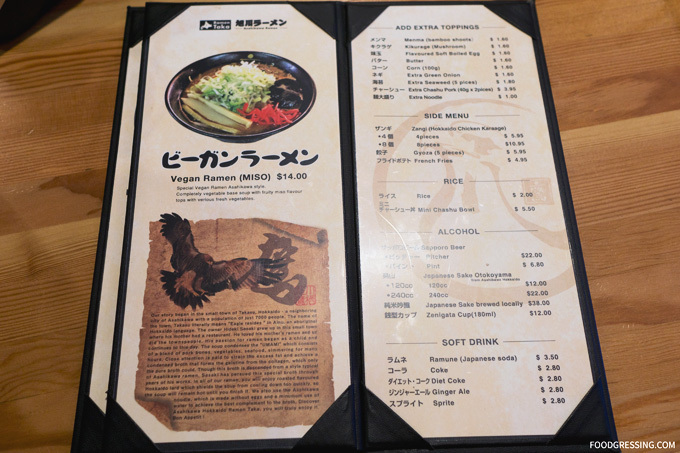 The vegetarian ramen option comes with thin noodles and is made with vegetable broth and an array of veggies: mushroom, baby leaf, spinach, asparagus, broccoli, cauliflower, cabbage, black pepper. This ramen flavour didn’t particularly appeal to me. The broth tasted too lean. Just because it doesn’t have meat doesn’t mean it can’t be good..read on more. The big surprise hit of the evening was how delicious the spicy creamy vegan ramen was. It is made with vegetable broth, tofu, onion, green onion, spinach, crispy onion, garlic chips, garlic oil, chili oil, sesame seeds with thick noodles. 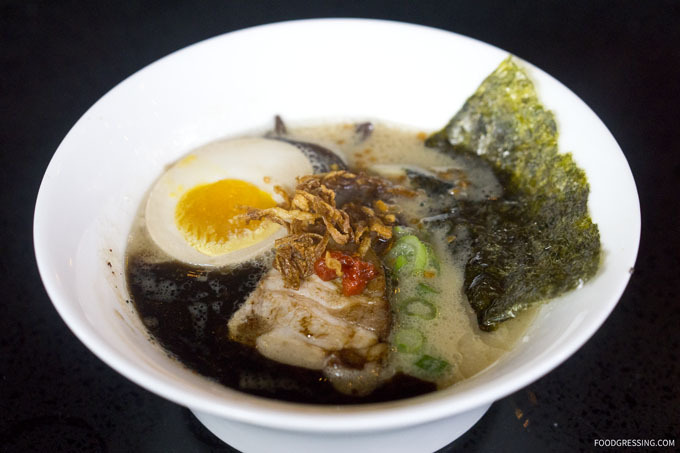 Packed with great flavour, oozing of creaminess and overall a ramen that is worth getting. Bonus points for the chili oil and seasame seeds. Totally recommend this for meat lovers. The spicy chicken ramen had just enough heat to tickle the tongue. A solid chicken option made with chicken broth, chicken chashu, spinach, spicy bean sprouts, green onion with thin noodles. For garlic lovers, the Cha Cha Cha is the recommended option. Made with pork and fish broth with pork chashu, seasoned egg, bean sprouts, chopped onion, green onion, garlic, chili powder and thick noodles. Maybe I’m a purist but the mix of pork and fish broth didn’t appeal to me as much. My favourite items of the evening were the Brussels Sprouts Tempura, Takoyaki, Tonkotsu Black Ramen and Spicy Creamy Vegan Ramen. 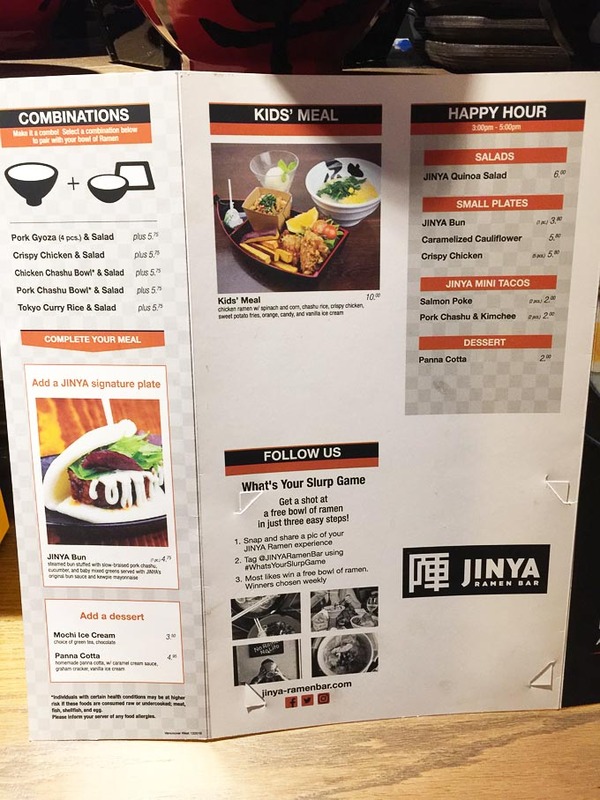 Congrats to Jinya Ramen on their new location and expanded menu. Looks like it’s going to be a good one. 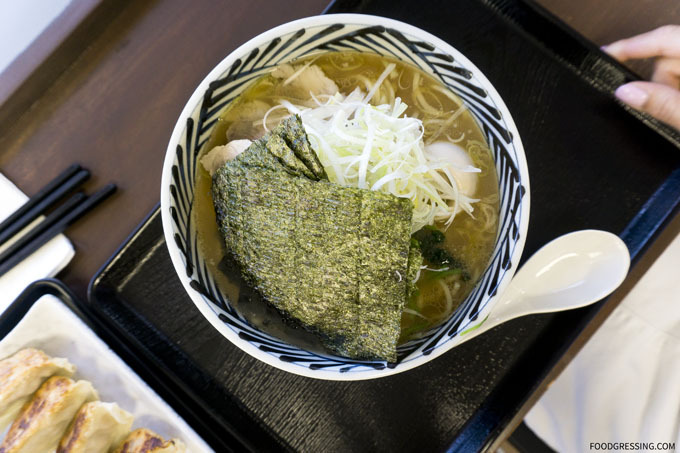 Fans of Japan-based chain, Hokkaido Ramen Santouka, have a reason to rejoice. 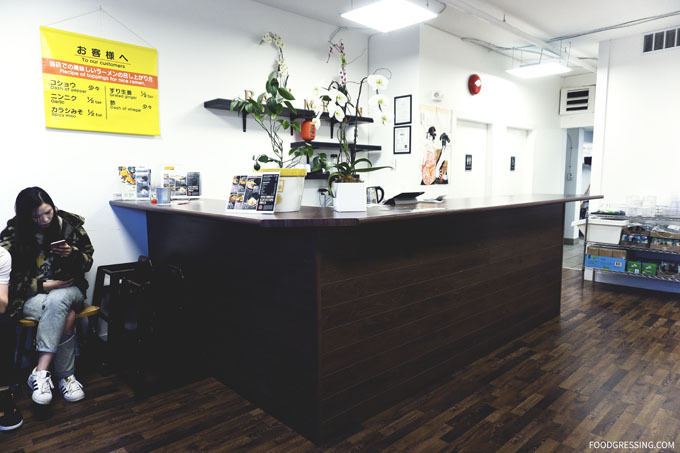 Santouka West Broadway had their grand opening on January 31 and is located at 558 West Broadway near Cambie Street. 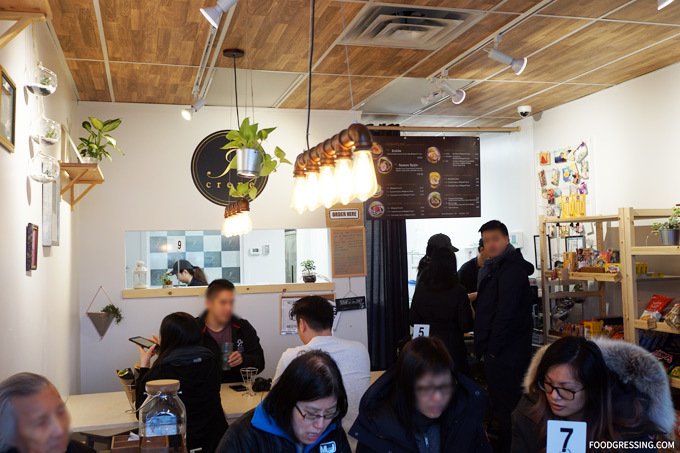 Santouka’s first Vancouver location is at 1690 Robson Street and is known for long line-ups. I decided to pop in for a solo lunch this past week. 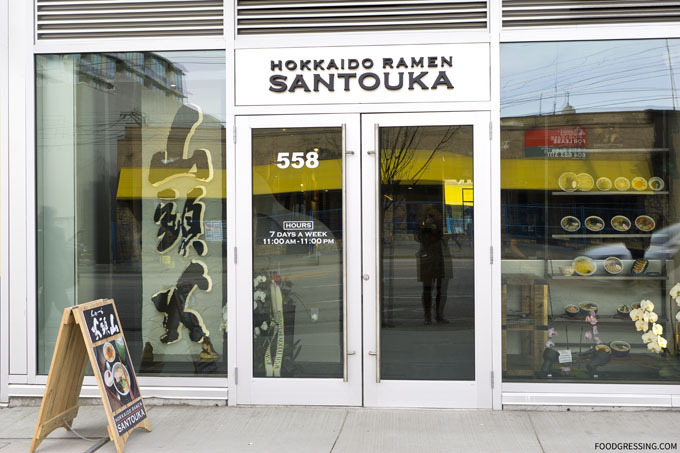 Santouka’s newest location is larger than the Robson one with 44 seats (versus 36 at Robson). I was quite impressed with how much more comfortable this restaurant with the added space. The interior is also more modern and chic with dining tables and cozy banquettes as well as a bar near the kitchen at the back. According to the Georgia Straight, they have incorporated some decor pieces from the Ainu. The Ainu are the indigenous people of northeastern Japan (including Hokkaido) and easternmost Russia. If you sit along the bar, you can watch all the action in the open kitchen. 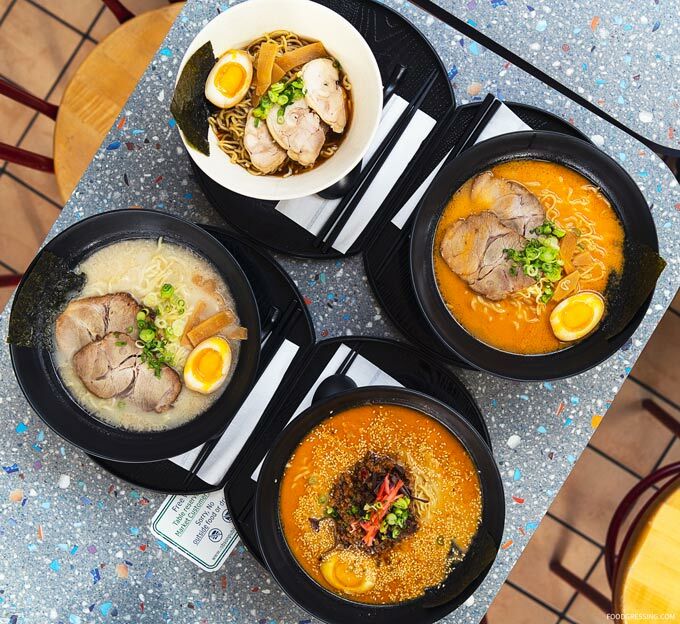 Exclusive at this West Broadway location is the jalapeno ramen and the zangi (the Hokkaido recipe for chicken kaarage). 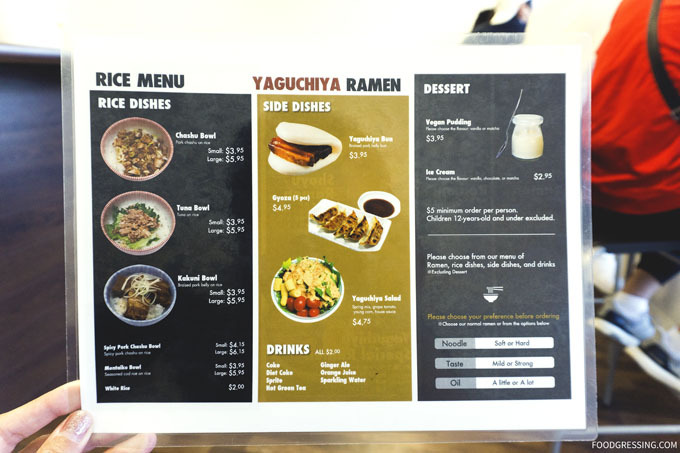 Regular menu items include their signature ramen, tsukemen, cold salad ramen, rice bowls, toroniku ramen and more. 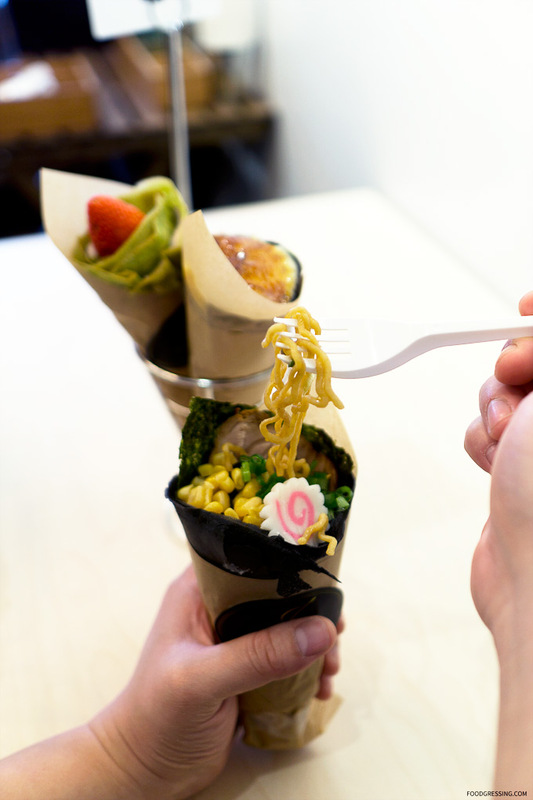 They also have combos with ramen and a rice bowl. Appetizers include toroniku (simmered pork jowl), goro-niku gyoza (fried pork dumplings) , tofu and shrimp salad and more. Below are photos of the menu. For my lunch, I simply went with my favourite at Santouka, a shio ramen ($13). The kitchen is fast and the ramen was presented to me within 5 minutes of ordering. 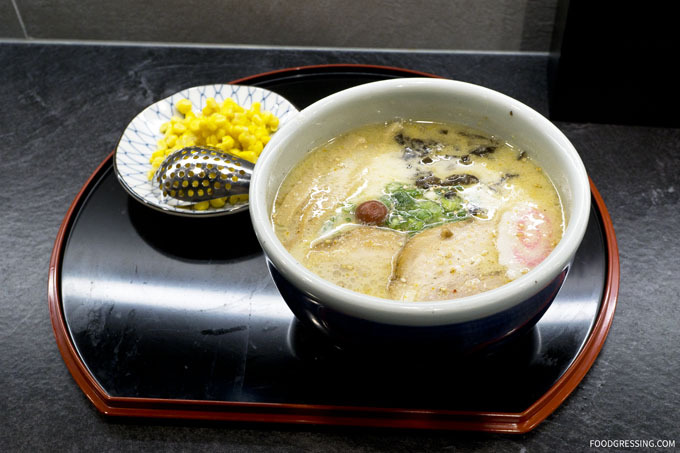 Santouka’s mild and creamy signature soup is made by simmering pork bones and rib broth for 48 hours. 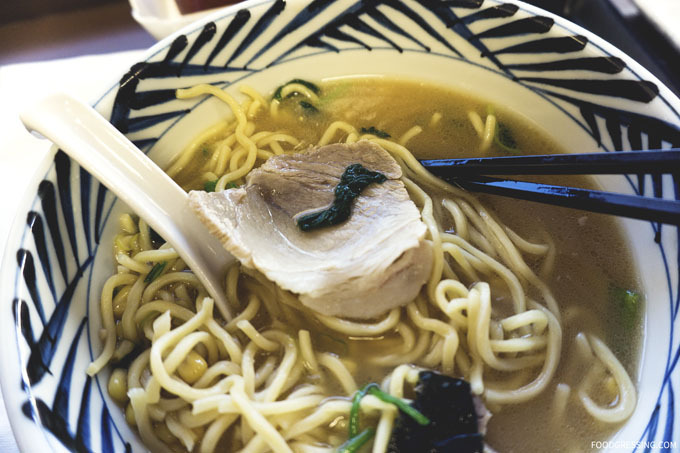 You cannot go wrong with the shio ramen, where the pork broth is seasoned with salt. The soup is creamy, flavourful and very drinkable while the pork cha-shu is tender and is not overly fatty. Their noodles are al-dente but one note is that they are pre-packaged and machine made noodles. 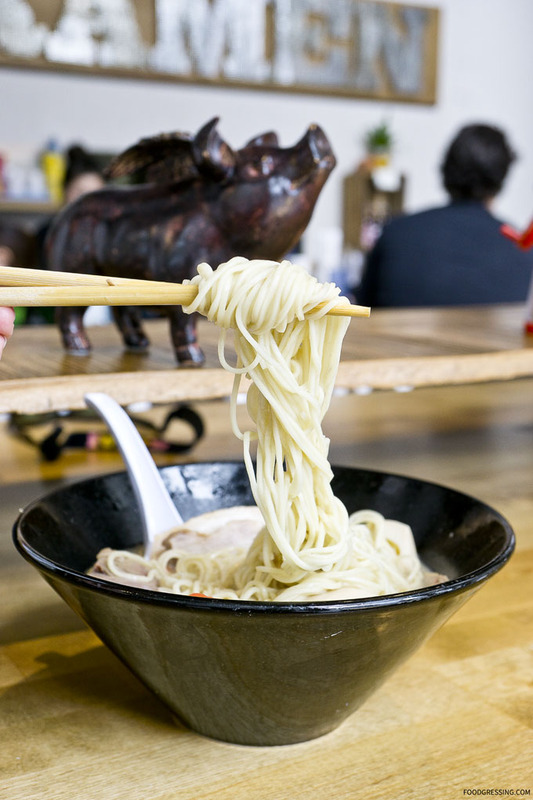 For house-made noodles, there is Ramenman. 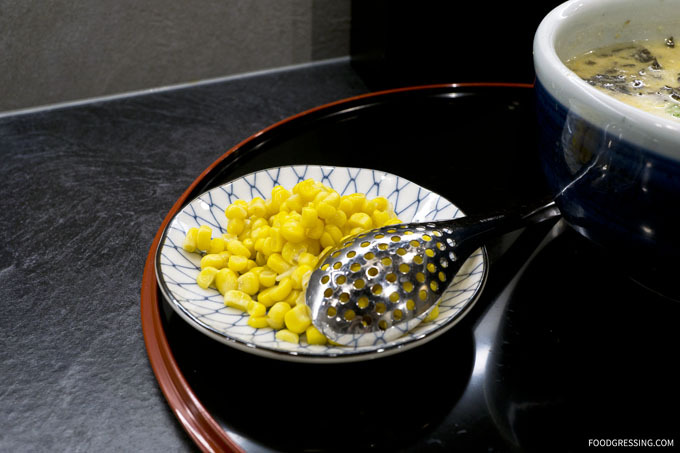 I love some sweet corn in my ramen and this extra topping costs $2.20 at Santouka. Definitely pricey considering how much you get. At Yah Yah Ramen, I paid $1.60 for corn and portions are about the same as Santouka. It made me want to bring my own grocery-store bought canned corn. Flavourwise, I have no complaints. But portion-wise, there could definitely be some improvement. My bowl of shio ramen with corn cost $17 including tax and tip. Unfortunately, I wasn’t all that full! I had a look at Santouka West Broadway’s Yelp page and a few other reviews also complained that the portions were small for the price. Seems like I’m not the only one. 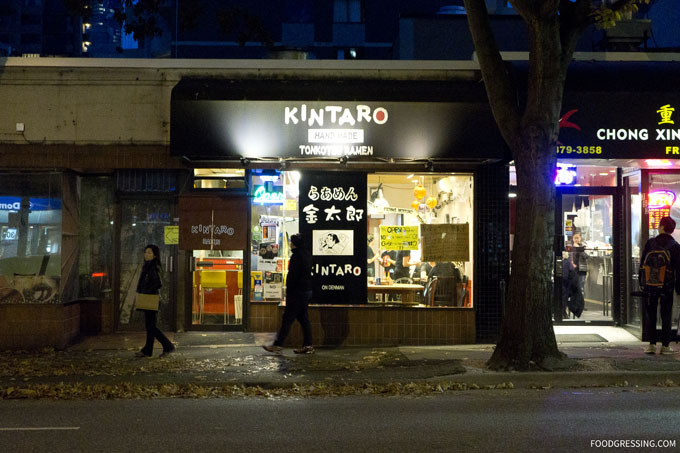 Kintaro is one of the most iconic ramen houses in Vancouver serving ramen lovers since 1999. 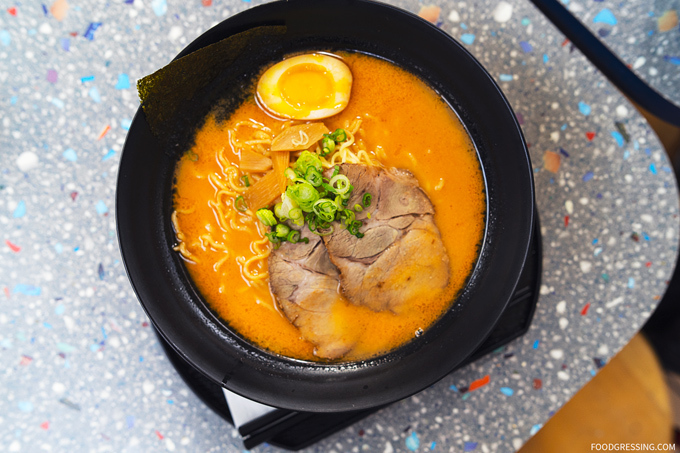 Line-ups are common as loyal customers return for comforting bowls of ramen. Over the past year, I have eaten at Kintaro many times. I love going there for a piping hot bowl of ramen on a rainy or cold day. Here is an overall review of my experiences at Kintaro in the last year. 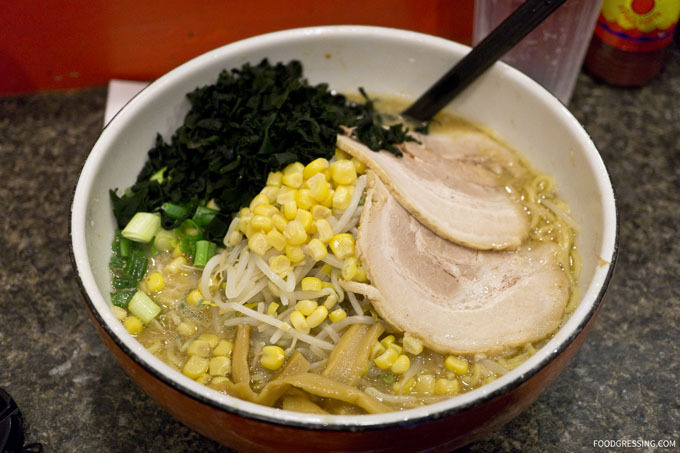 Kintaro offers 14 types of ramen ranging from basic (like shoyu, shio, miso) to specialty (like cheese and cold). Their broth has been reported to be simmered for 22 hours in order to maximize the flavour from the bones. You can also customize your order by choosing the richness of your soup (rich, medium, light) and how fatty you want your cha-shu (fat or lean). 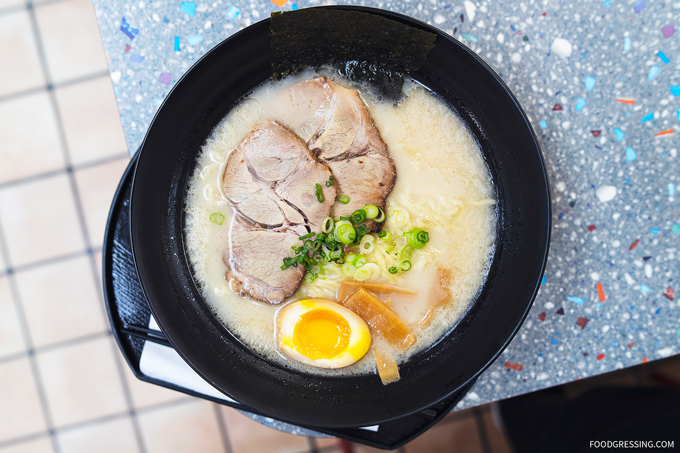 Ramen bowls are known to be budget-friendly and priced around $10 – $13. 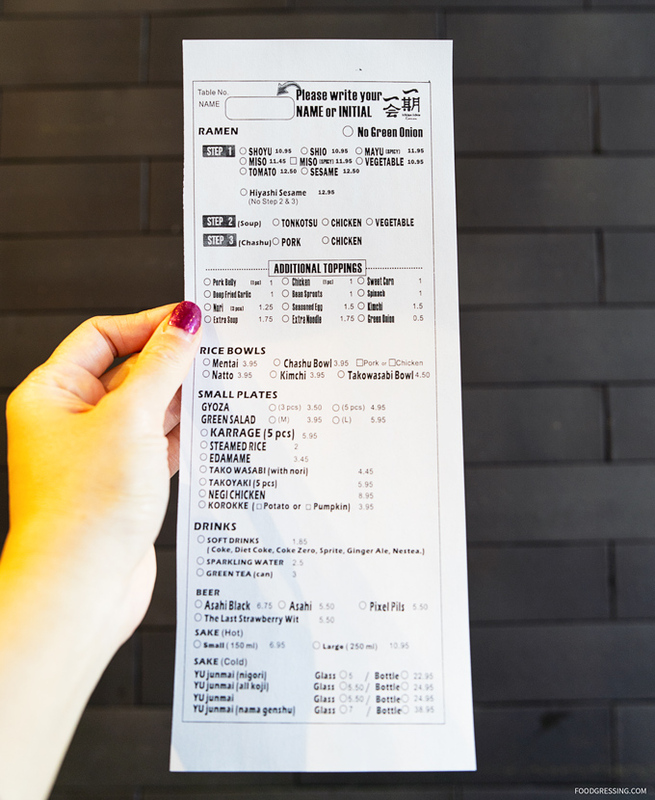 If you are feeling extra hungry, you can order additional toppings, meat, noodle and soup. 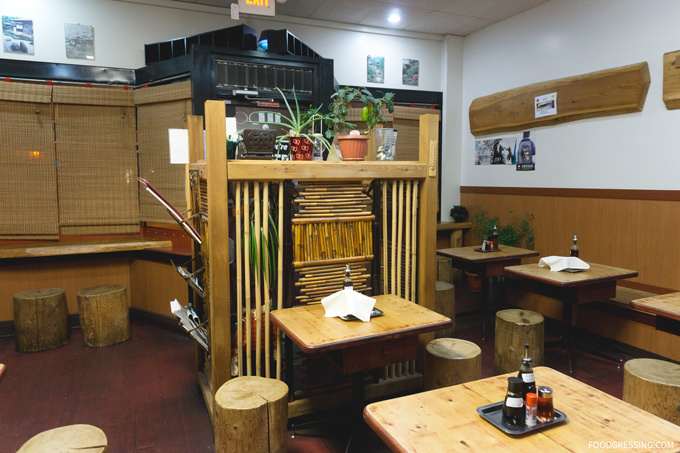 The interior of Kintaro is functional. 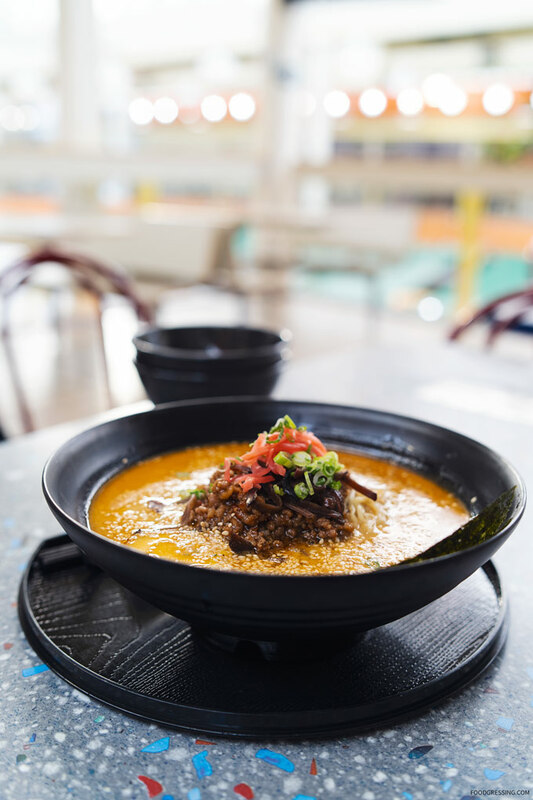 It’s an unpretentious eatery where you sit down, have your bowl of ramen, and be on your way afterwards to make room for a new customer. Not your kind of place to sit down for a long romantic dinner or to bring a large group of friends. Seating is mostly along the bar overlooking the open kitchen. There are a few two-person tables and one round table which is good for a small group or for communal seating. Photos of the kitchen are not permitted as indicated by a sign. 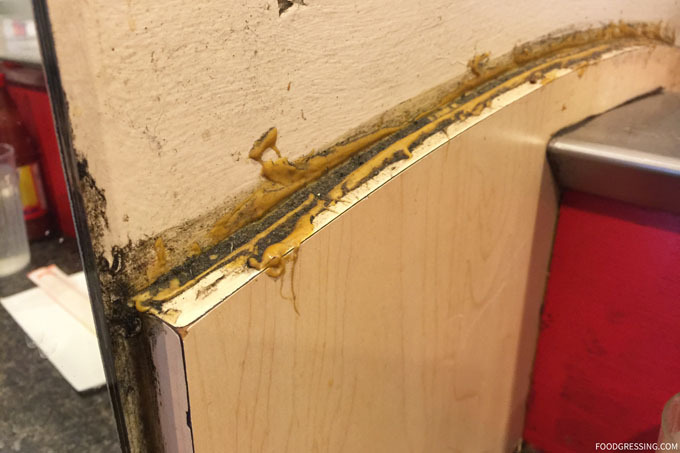 While I enjoy the food at Kintaro, I would like to raise issue of some cleanliness issues. On my last visit, I sat at the corner next to the while and noticed some highly disturbing yellow substance mixed in with dirt (I think?) on the wall. Kintaro really needs to work on maintaining their restaurant interior to an acceptable level. I have only gone with “standard” options for the In general, I have found that the noodles are cooked al-dente, the cha-shu nicely gelatinouos, and the broth to be rich and flavourful. The portions of noodles and other ingredients are reasonable too. My favourite is the miso ramen, which is Kintaro’s best ramen. The soup is blended with soy bean paste and Japanese spices so it is very flavourful. I love to add in seaweed for some extra oomph. If I were extra hungry, the BBQ ramen is the best choice. It comes with 6 pieces of cha-shu which is bound to make you full. The shio ramen is simpler in flavours as the soup is much milder. If you’re not planning on getting to close to other people after your meal, you might want to go for the spicy garlic ramen. It comes with a ball of freshly ground garlic and has enough heat to tickle the taste buds but not set them on fire.